Last core opened & sampled! 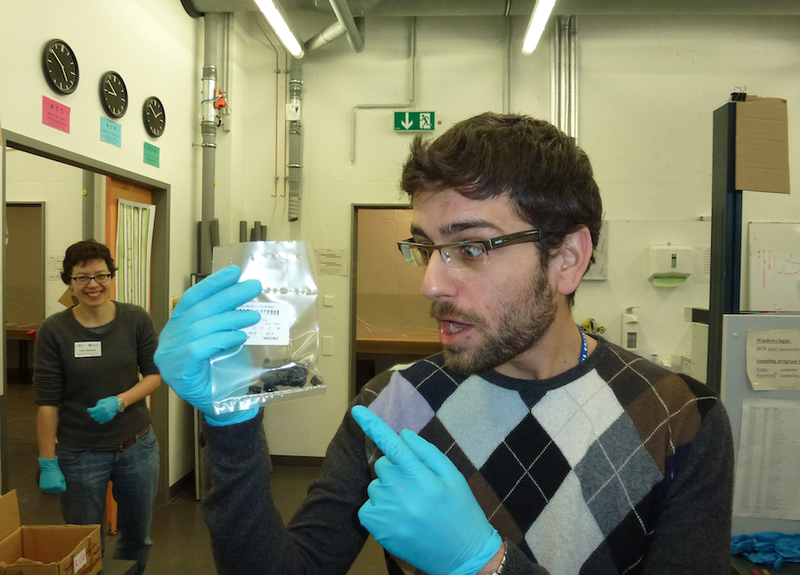 We opened and sampled the last cores! We’re now really nearing the end of the sample party. 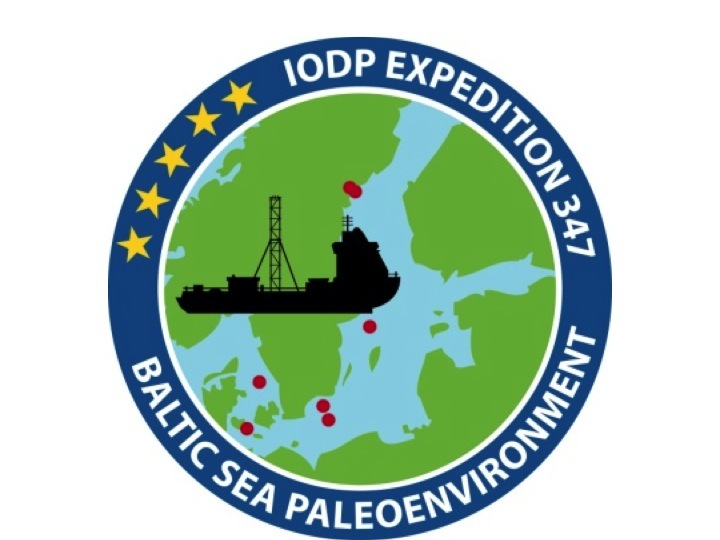 One of the IODP traditions involves the making of an alternative logo by one of the participants. 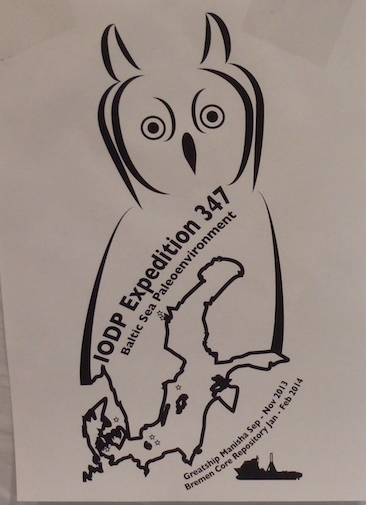 Our logo was made by Ian Marshall and includes the owl that visited us at the Landsort Deep station during the cruise. It’s quite different from the official logo (see the first blog post below). Another tradition is a group photograph of the whole science party. Two more days to finish all the reports and then we’ll say goodbye. We will meet again several times over the coming years to discuss results! More than 1250 meter of core has now been opened. 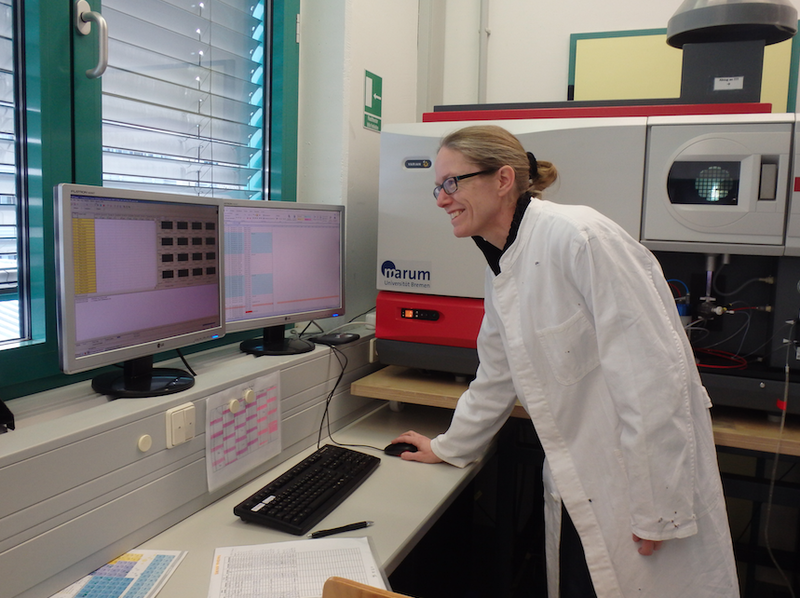 More than 25.000 sediment samples have been taken. 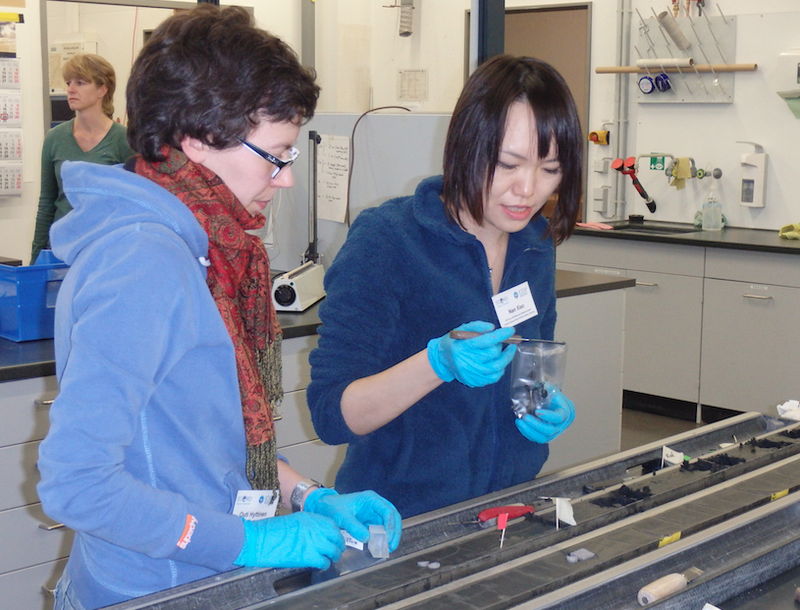 Sampling of the sediment still continues steadily! The amazing discoveries also still continue…such as the finding of this huge concretion (with a diameter of many cm's) in a sediment core…. ....and report writing in what is called the scientist's office. Two months from now, a summary of our initial results will be made public and we need to make sure that we get everything written up before we leave for home at the end of next week. But because of the good progress we’ve made so far, we’re getting a 3.5 hour break today! For the day shift, that means we can see the city of Bremen during the day for the first time! We’re halfway the sampling party. 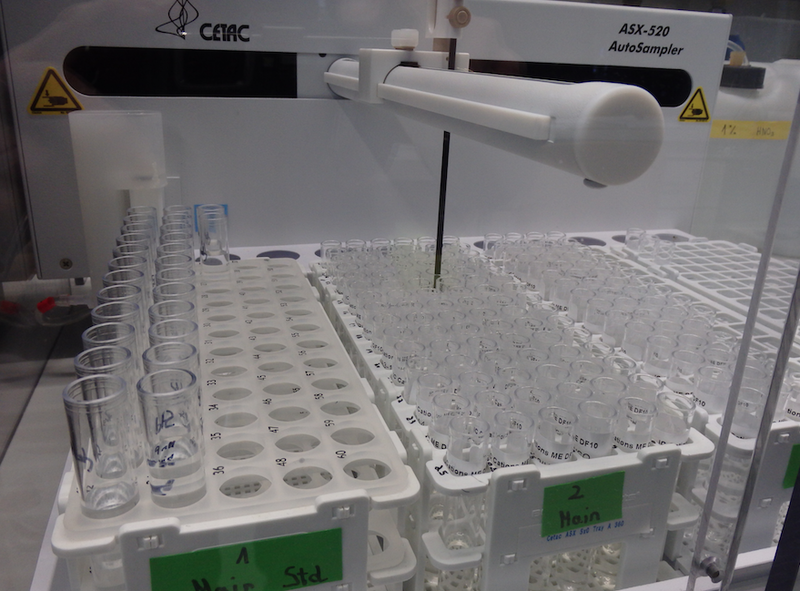 Every day, the various sampling tools are in use from morning to night. 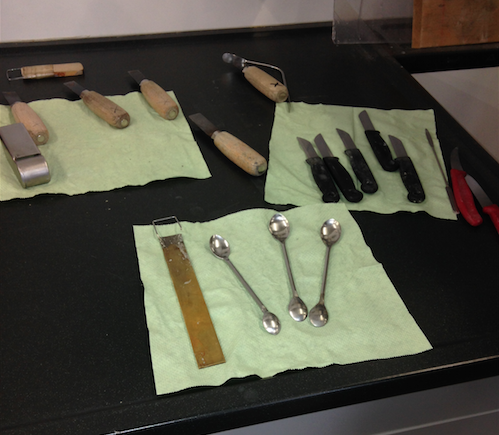 Besides various ingenious sample devices that were especially designed for sediment sampling we’re using simple household utensils. 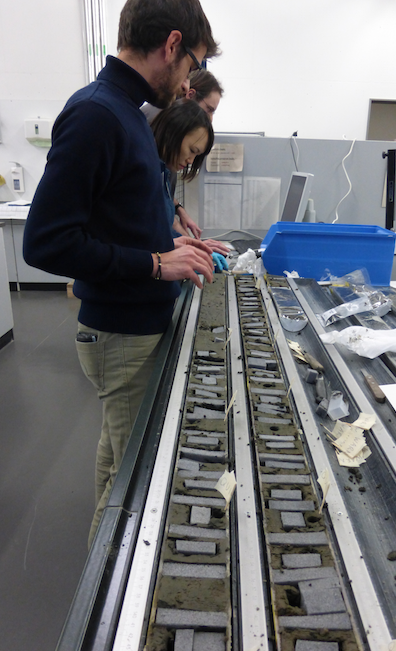 In the cores, we’re finding a wide range of sediment types: sometimes sands, but mostly various sorts of fine-grained sediments. And we’re seeing distinct differences depending on the location and sediment depth: sometimes the sediments are “striped” showing alternations of dark and light layers, sometimes they are more homogeneous in composition. Alternating dark and light sediment layers can form in different ways: They can, for example, be indicative of low oxygen conditions in the bottom water. 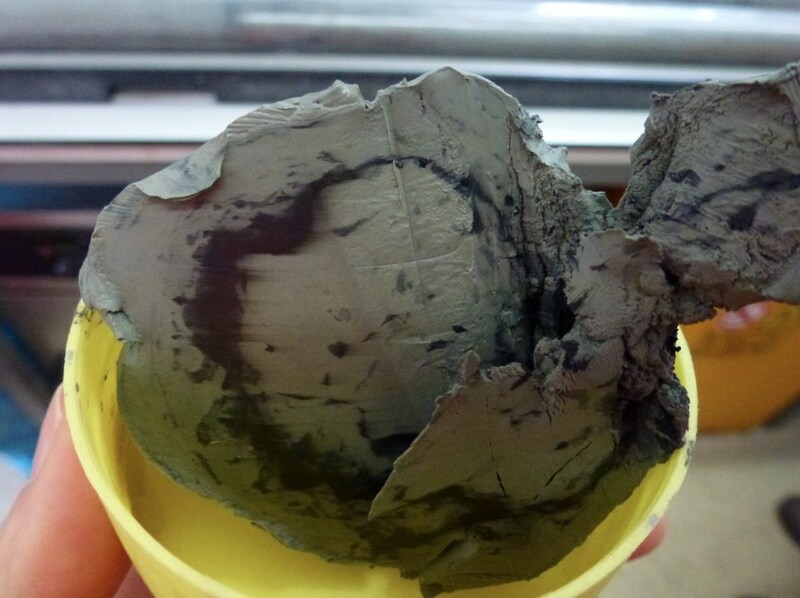 In Baltic fresh water sediments, we also find “varves”, layers that are formed annually – for further details, see the blog of Sandra Passchier. And we’re finding other really interesting things as well: like these strikingly bright blue spots in the sediment. That’s the iron-phosphate mineral vivianite. It is known to form from porewaters that are rich in dissolved iron and phosphate. It is most common in freshwater sediments. 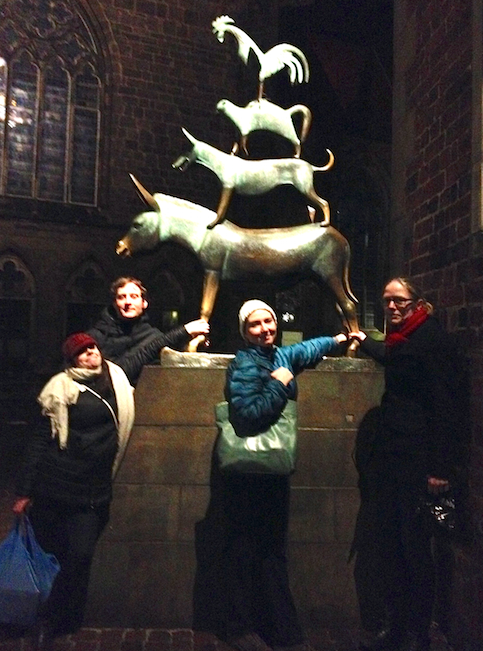 Although there is every little time to do anything besides work, we’re trying to see something of Bremen by foot when we occasionally have dinner or a drink in town. Nice city center, but dark! When you are on the day shift, you don’t see any daylight when not working! We’ve reached a milestone! We’ve got 400 m, that is 25% of the total core length of 1600 m, sampled. 1200 meters to go! At this pace, we should be able to finish within one month as planned. When we’re done, the remaining material will be placed back in the enormous hall at the Bremen Core Repository and stored for future users. This is an impressive facility. I wish we had a core storage like this at my home university! 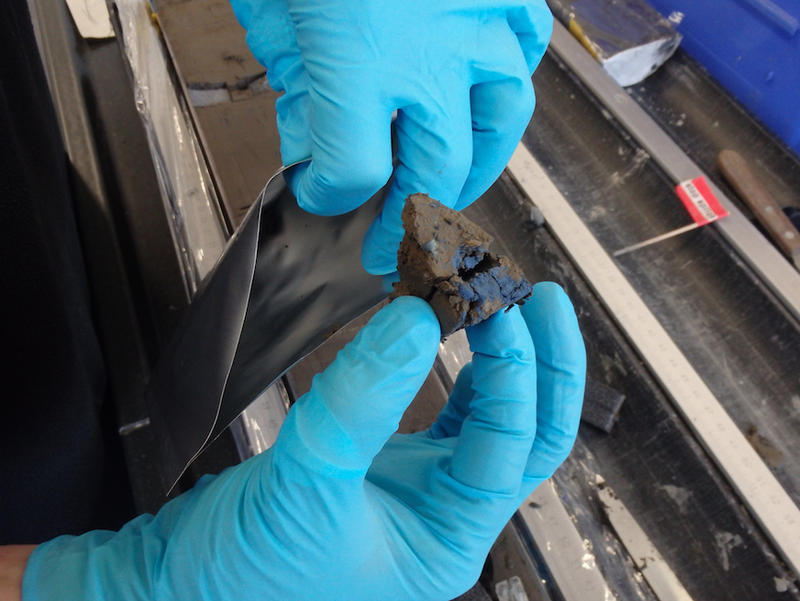 Opening the cores allows us to finally see in detail what kind of material we have collected. 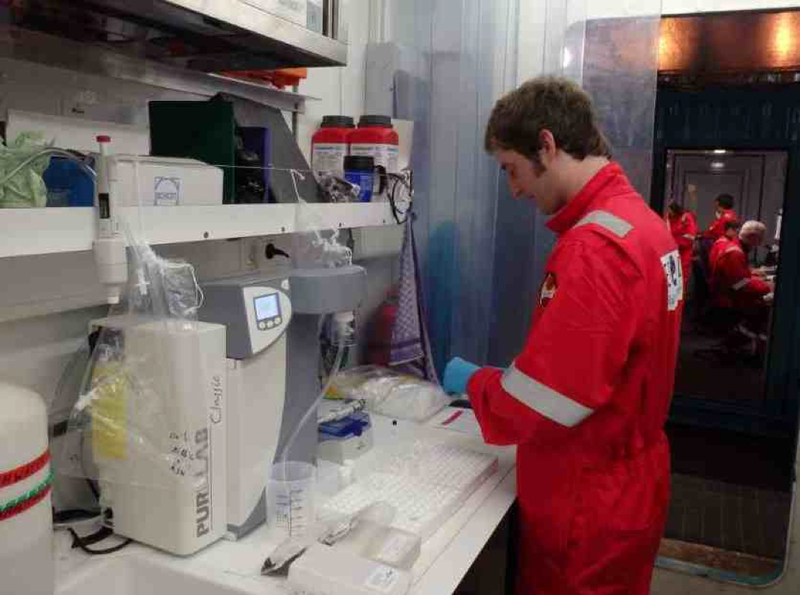 We’re particularly interested in finding evidence for changes in environmental conditions. For example, we know that the Baltic Sea used to be a lake and became connected to the oceans after the last ice age thousands of years ago. We can now study the differences in the lake and marine sediments in great detail. The Geochemical work that I am involved in is also moving forward. 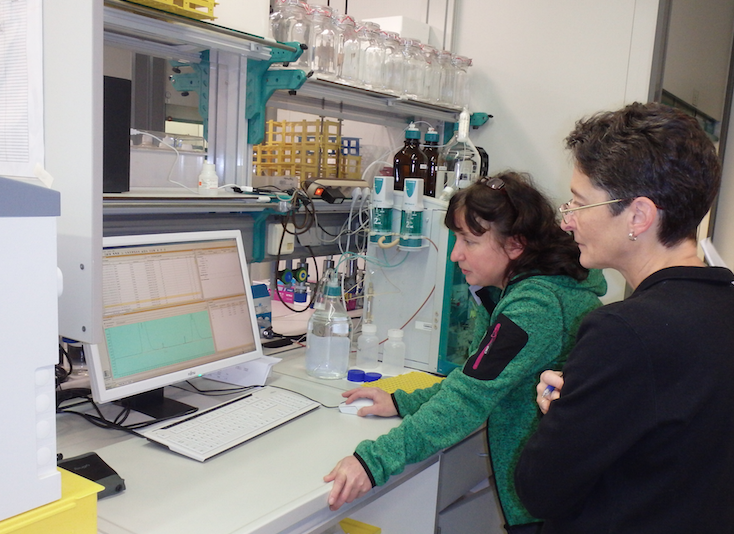 We now have two machines running day and night to analyse the composition of our pore water samples in detail. We're having short hall meetings at shift change to update each other on the results. 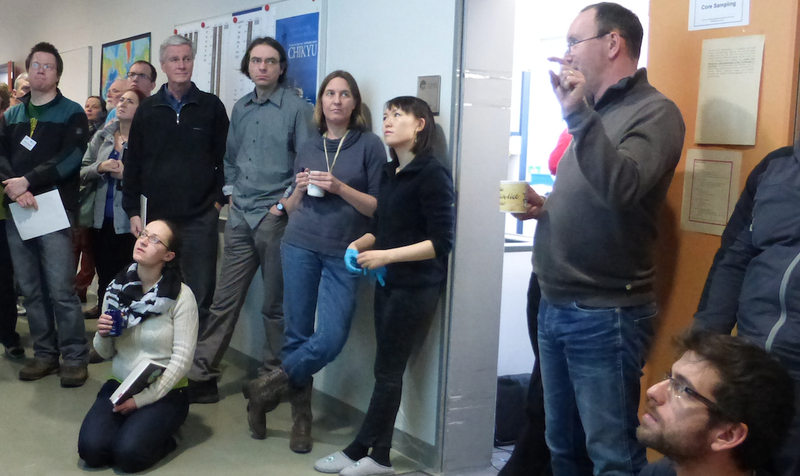 Putting the results of the whole science team together in a report is going to be our next challenge! The Onshore Baltic Sea Science Party has started! 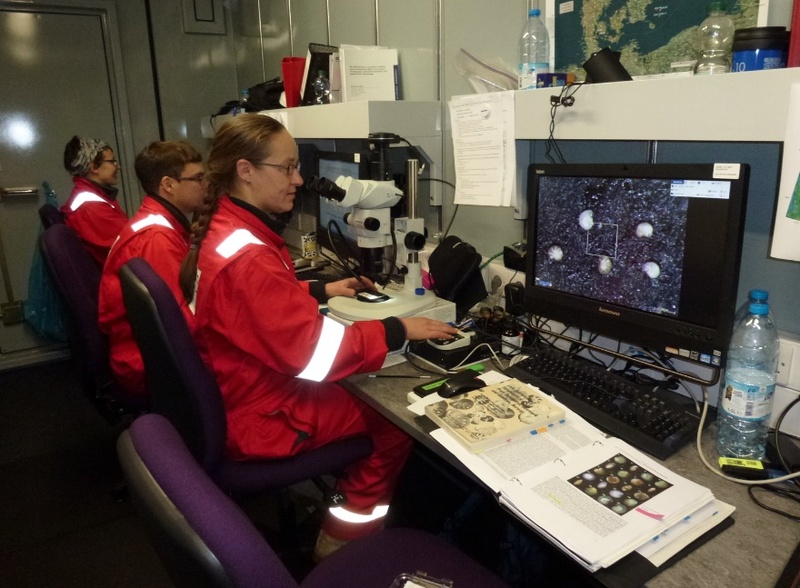 Last year, we collected more than 1600 meters of sediment core material and thousands of pore water samples during the IODP Baltic Sea Paleoexpedition during an intensive expedition from September 13 – November 1. 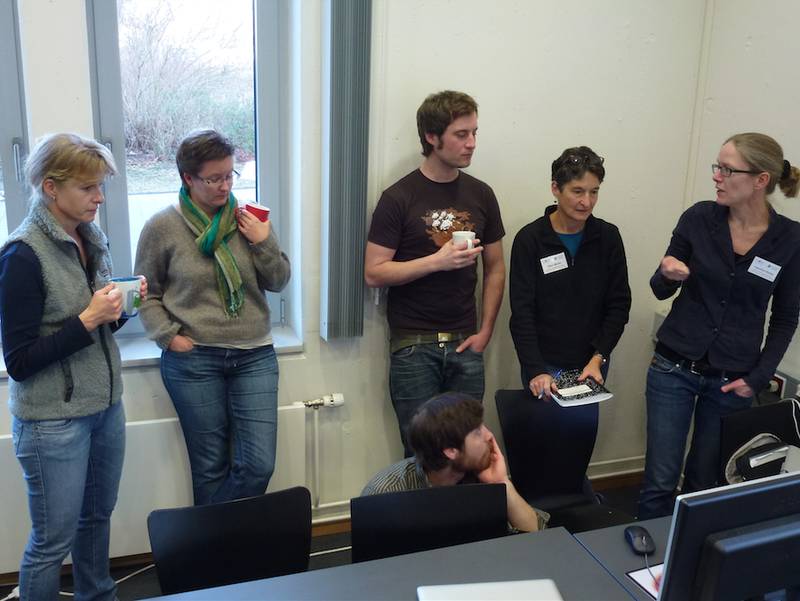 We now are meeting again in Bremen for detailed sampling and analysis of the sediment and porewater that was collected. And we are now working on the sampling of the first hole! We’re at the Marum (Center for Marine Environmental Sciences), by the way, with a much larger group of people than on the ship. Again, we’re working in two shifts. Luckily, this time, we don’t have to cover all 24 hours of the day…and our shifts overlap so that we get more chance to talk to all team members. 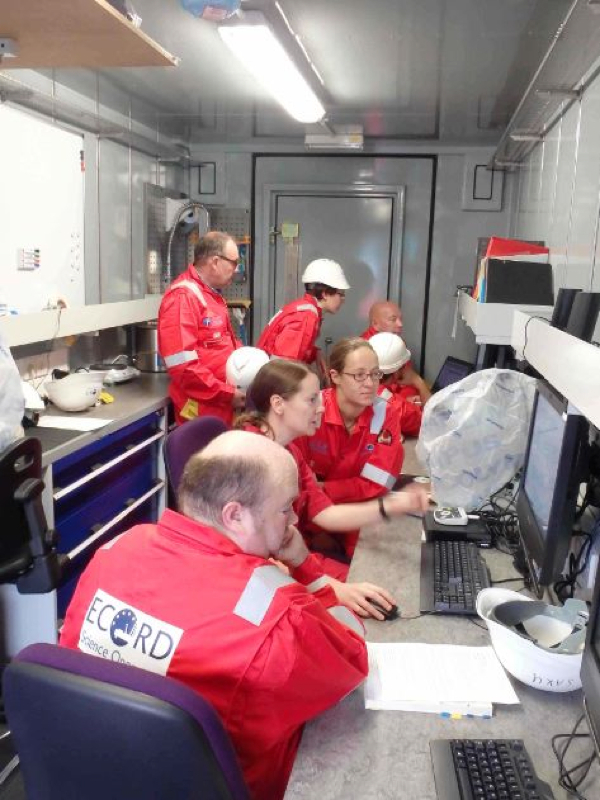 The geochemists are getting started on the more detailed analyses of the pore water samples that were collected on board. 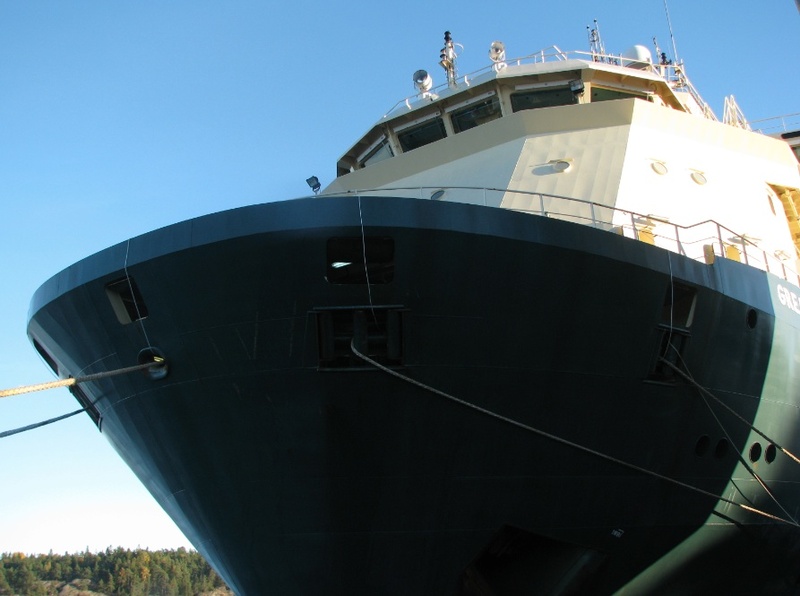 We’re looking forward to seeing the results and hope our hard work on board the ship pays off! It was a great expedition! We all worked incredibly hard: drilling, sampling, analyzing, logging, organizing… and we have very interesting preliminary results. 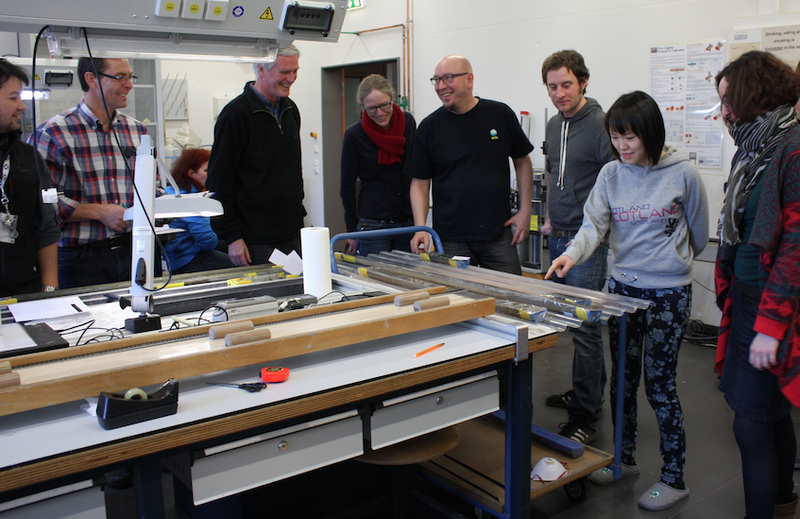 We are eager to open, describe and sample the large number of sediment cores that we obtained. We’ll do that at our 4-week sampling party in Bremen in January next year. sedimentologists / geologists Outi and Aarno (in Finnish) and Thomas (in Swedish). 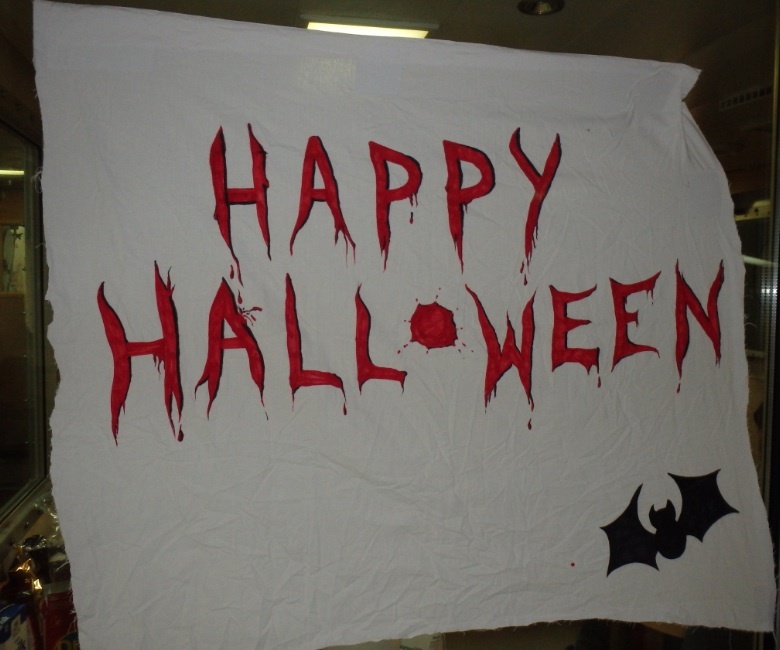 Before heading home yesterday, we had a last chance to talk while celebrating Halloween…. 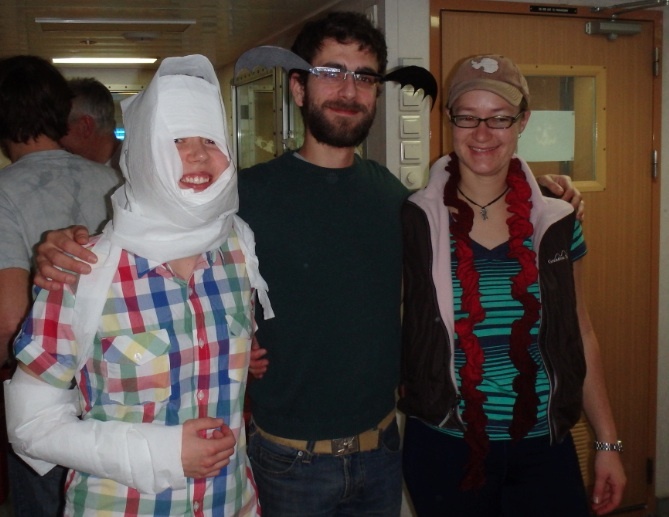 …with decorations made by Patrizia and various improvised (but great!) costumes. 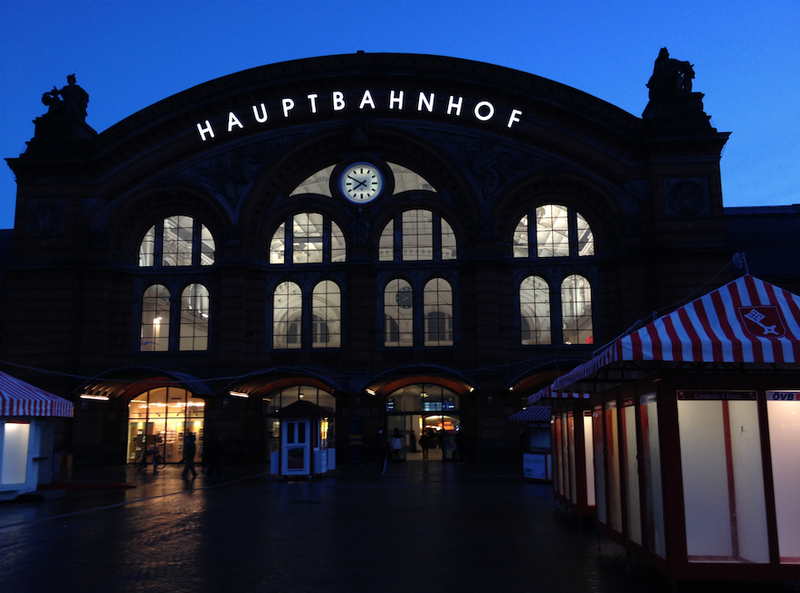 Shortly after arriving in Kiel the captain made a group picture…..
and we all began to go our separate ways – while most of the operational staff remained on the ship and are sailing to Falmouth through the Kiel Canal, the science party went to various airports, train stations and other destinations. We’re looking forward to meeting again in Bremen in a few months! Hurricane winds in the Little Belt & We’re going home! 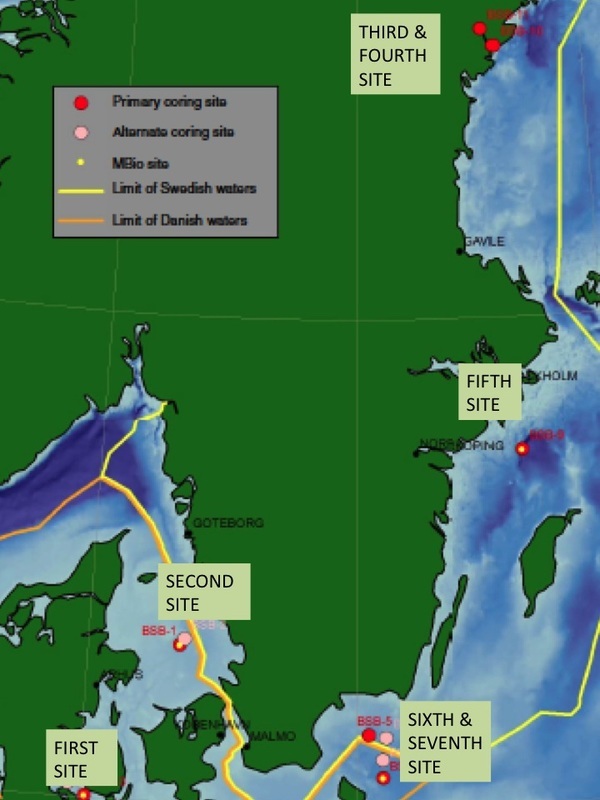 We’re in Danish waters now and are drilling in the Little Belt again (see the earlier maps in this blog). 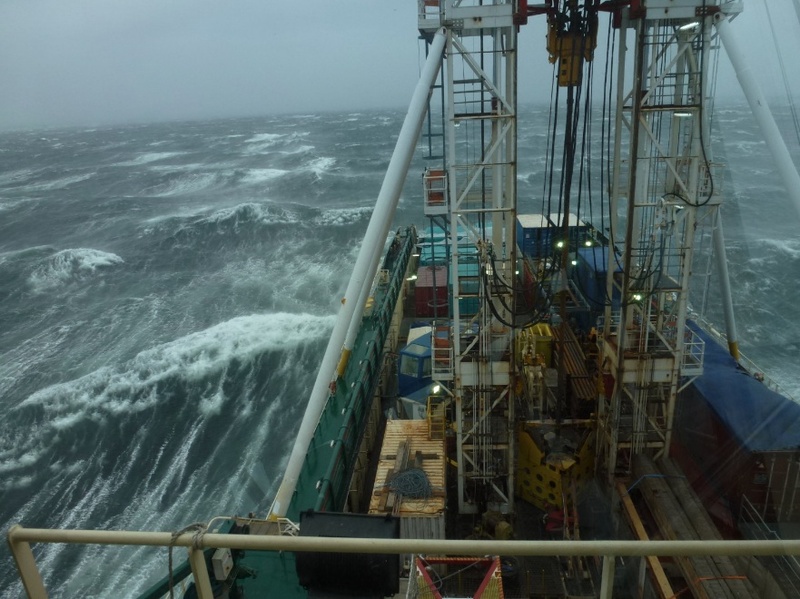 We arrived here on Monday and started coring at a new (8th) site, but a sudden extreme increase in wind in the afternoon made further drilling impossible. 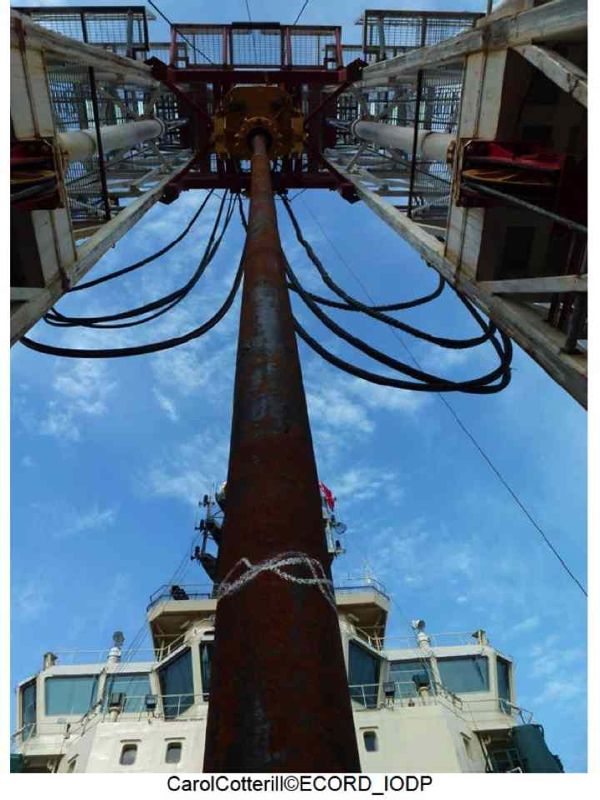 The drill pipe and template were quickly removed from the seafloor. We stayed on position for 10 hours while a major storm developed…. The dayshift-team were still at work in the “science garden” but the night shift team gathered on the bridge to view the dark skies, waves and foam. 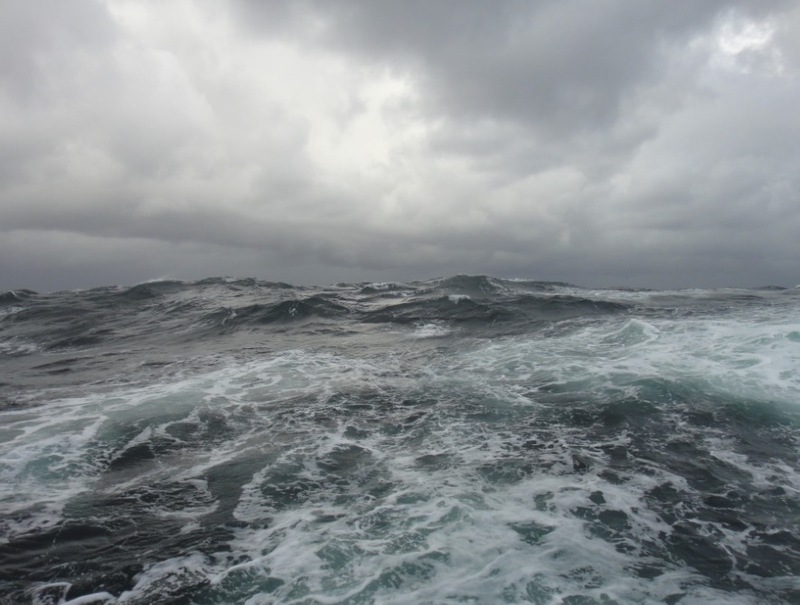 Given the sheltered environment we were in, the waves remained relatively low and there was surprisingly little movement of the ship. 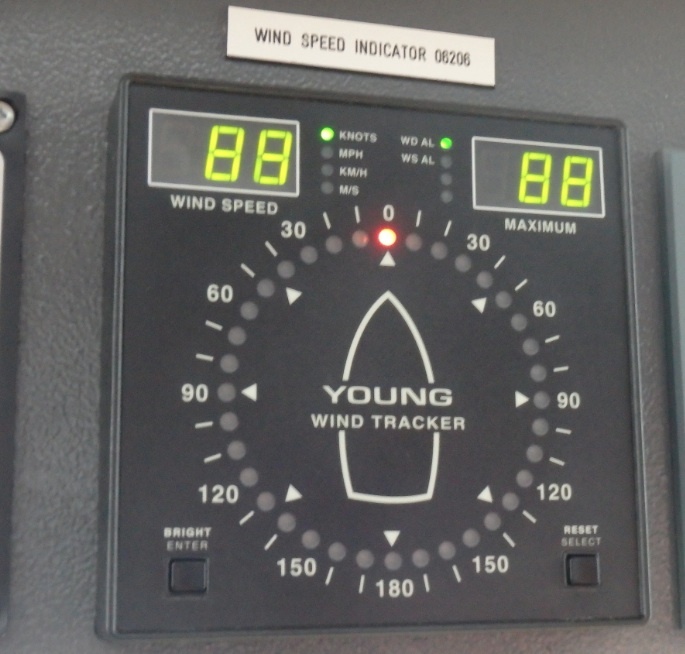 Wind speeds increased steadily, first to a maximum of 88 knots, as shown in the picture, and then to 98 knots, which is equivalent to ca. 180 km per hour! The next day, we discovered that the plastic “roof” of the science garden had been partly ripped off. We now suffer a bit more when it rains. But not for long! We’re going home earlier than planned! We’ve completed our 7 key stations and the 8th station in the Little Belt is less of interest than we thought. 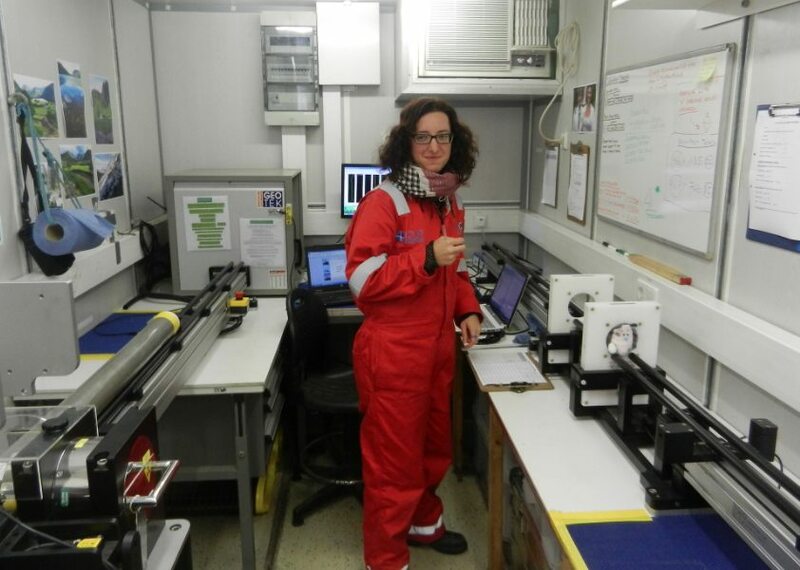 We are drilling at our 1st station in the Little Belt again to get some extra samples and when that is done we are going to head for Kiel this coming Friday! We’ve had a great cruise, but are also glad to be going home again! 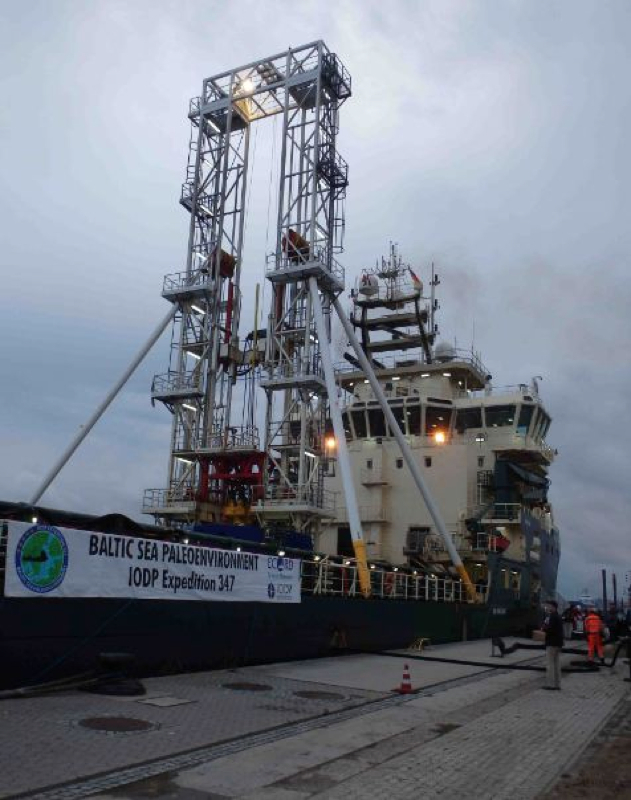 We’re currently drilling in the Bornholm area. Although we are expecting stormy weather again soon, it’s warm, calm and sunny today. This area is known for its old ammunition from World War II. That’s why an ROV (remotely operated vehicle) with a video camera was let down to the seafloor to check out the surroundings first. 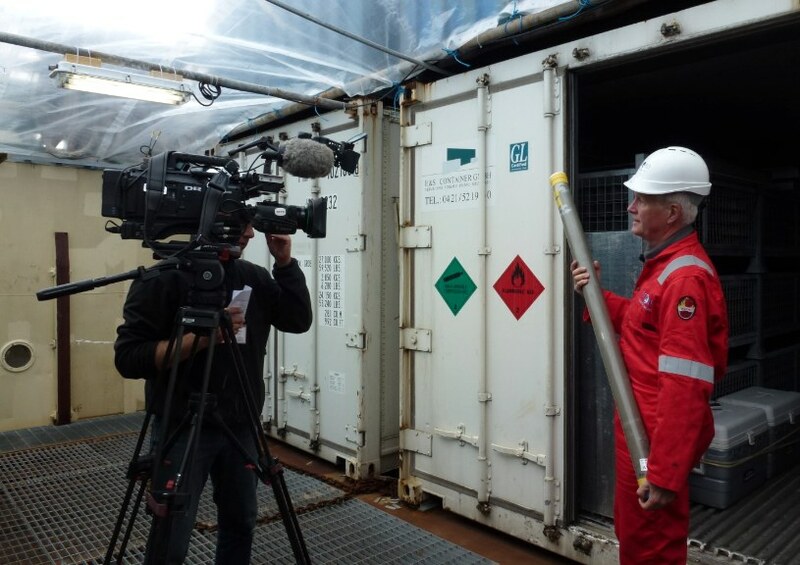 The videos showed that there is no sign of ammunition at our drill site. There are bacterial mats though! Those are the white patches on the right. The bacteria are “Beggiatoa” that thrive in areas where there is sulfide near the sediment surface. 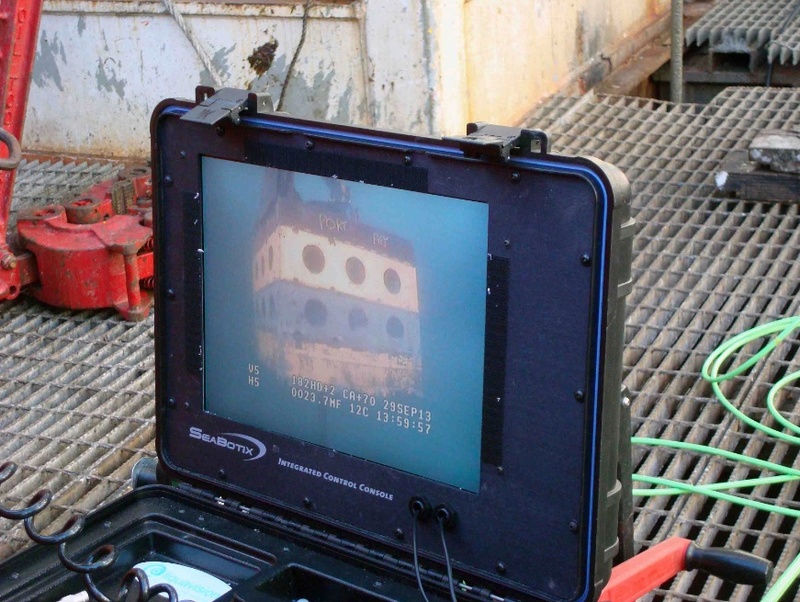 At one of our earlier sites, the ROV was used to follow the position of the template under water. It’s a great piece of equipment! 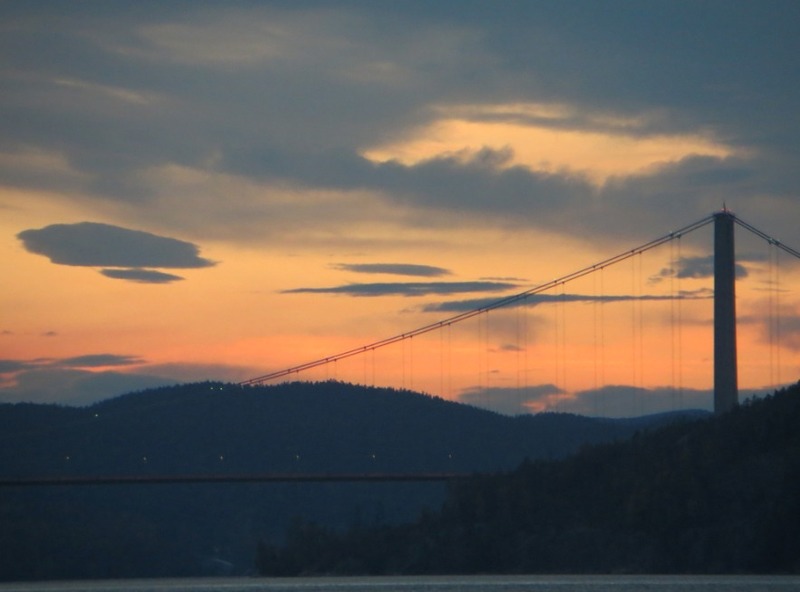 Because the days are getting shorter, we’re seeing less daylight each day. 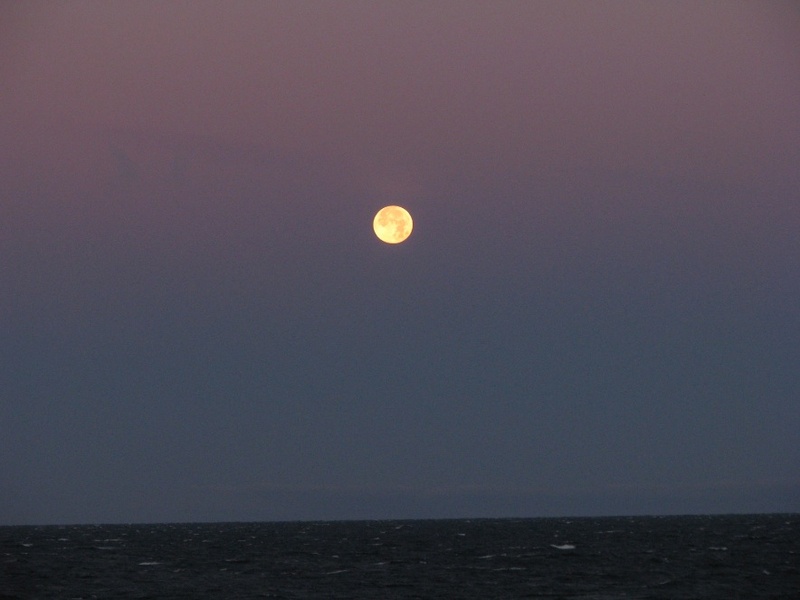 But the view from the ship at night can be beautiful as well. The last few days and nights the weather was not so great. 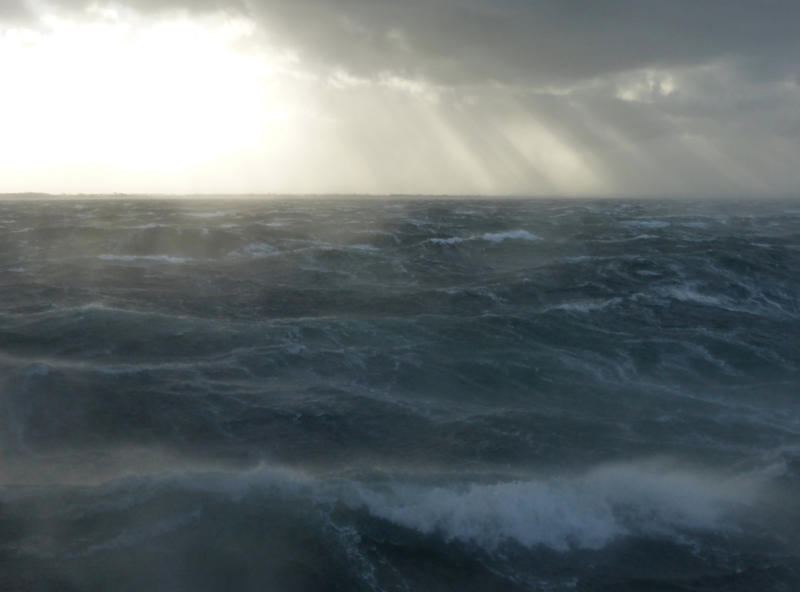 Wind and waves (and seasickness) came and went, but the cloudy skies and rain have stayed, with the sun only being visible occasionally. 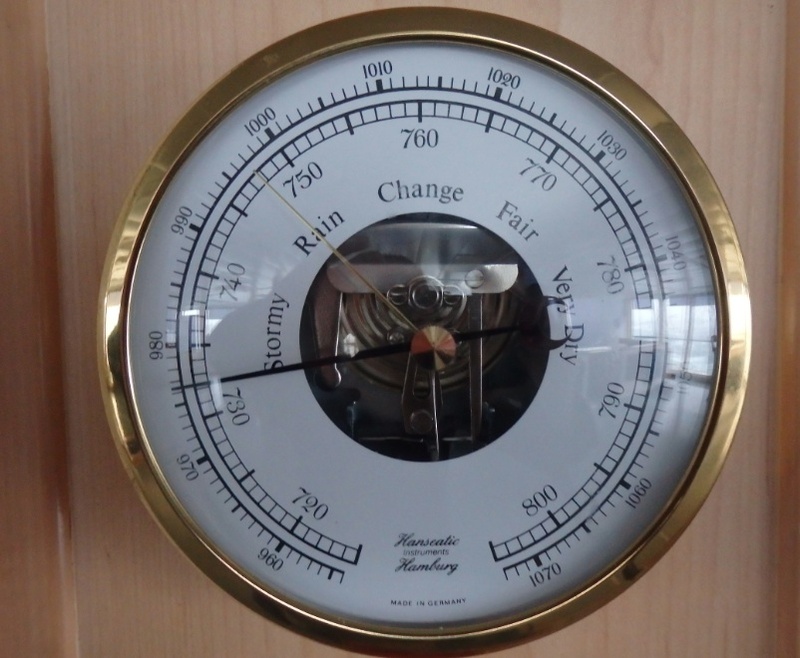 There are now often local rain showers in the “science garden”…. Luckily, we have plenty of chocolate, coffee and tea to keep us going at night. We’ve now left the Landsort deep and have moved to the south – we’re drilling two sites near the southern tip of Sweden. 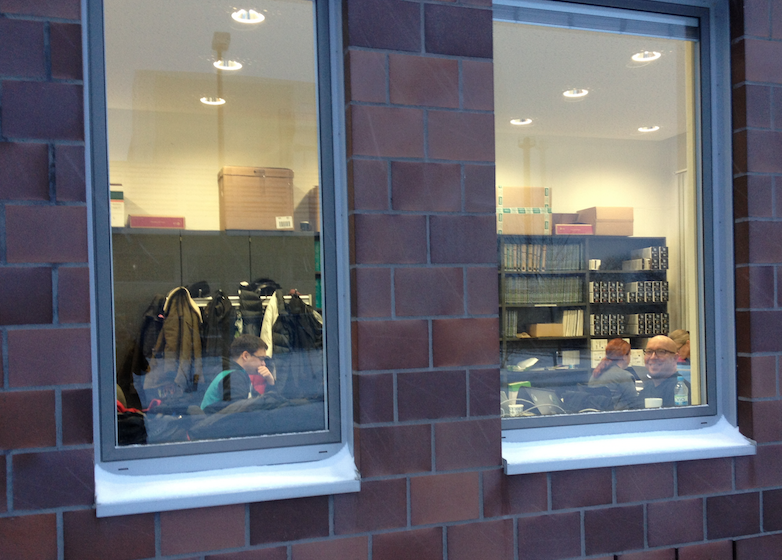 These are our sixth and seventh site, located in the Hano Bay and Bornholm area, respectively. The samples are steadily coming on deck again. Despite the not-so-great weather, we’re still going strong! 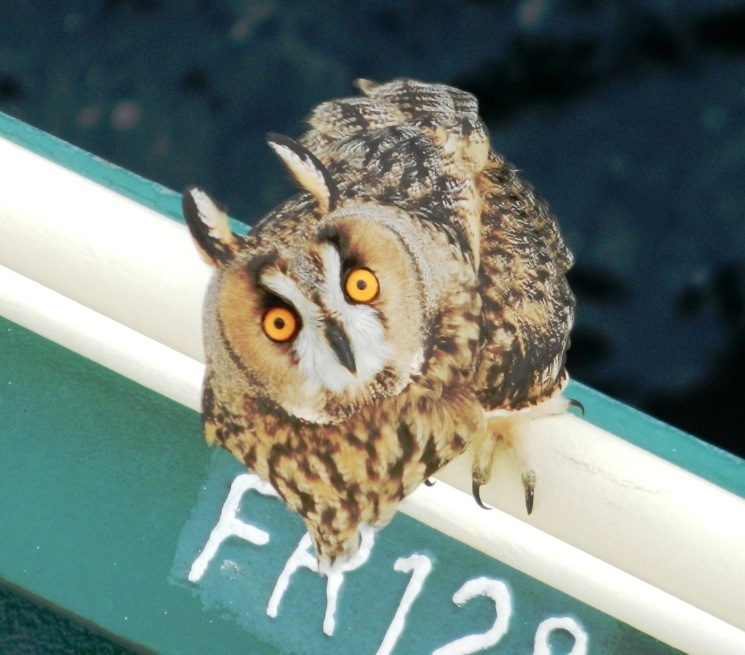 …and more recently a beautiful owl…. 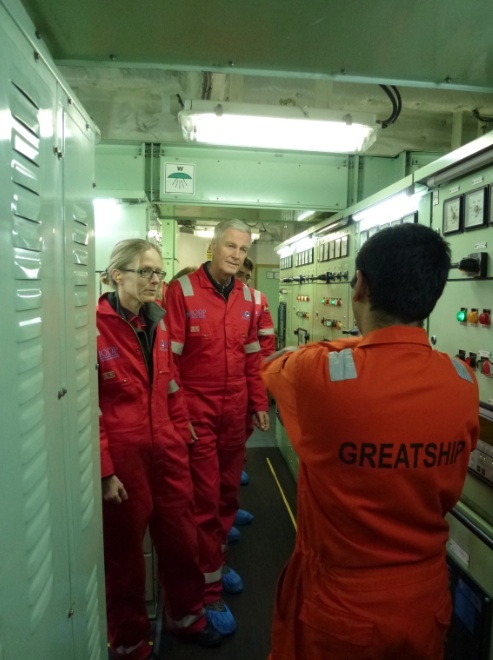 The nightshift team that I’m part of had the chance to visit the engine room and other facilities below the working deck that provide us with power, water and thrust. It was like entering another world – room after room of shiny, bright colored and grey machinery, all in perfect condition. Incredibly impressive! 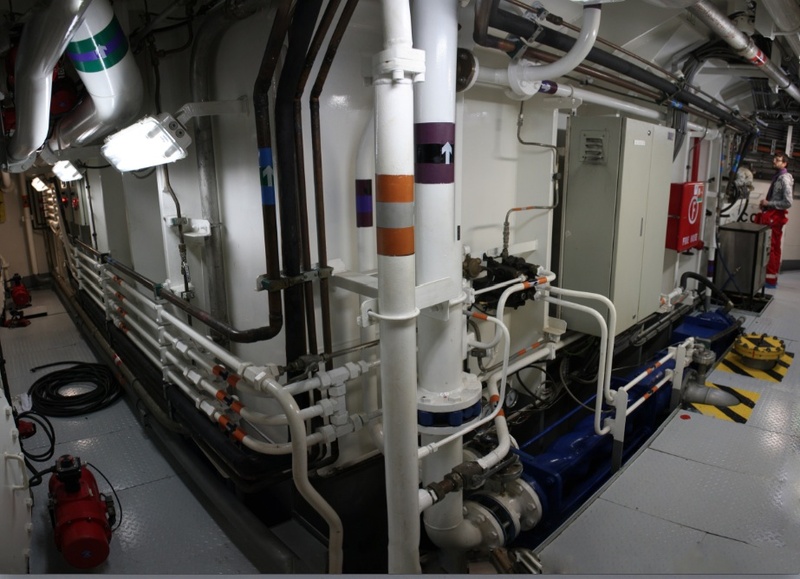 The ship generates it’s own electricity with separate systems for the starboard and portside of the ship. If you look carefully, you can see that we are wearing earplugs because of the noise. From below the deck, you can also see the sides of the so-called “moonpool”. 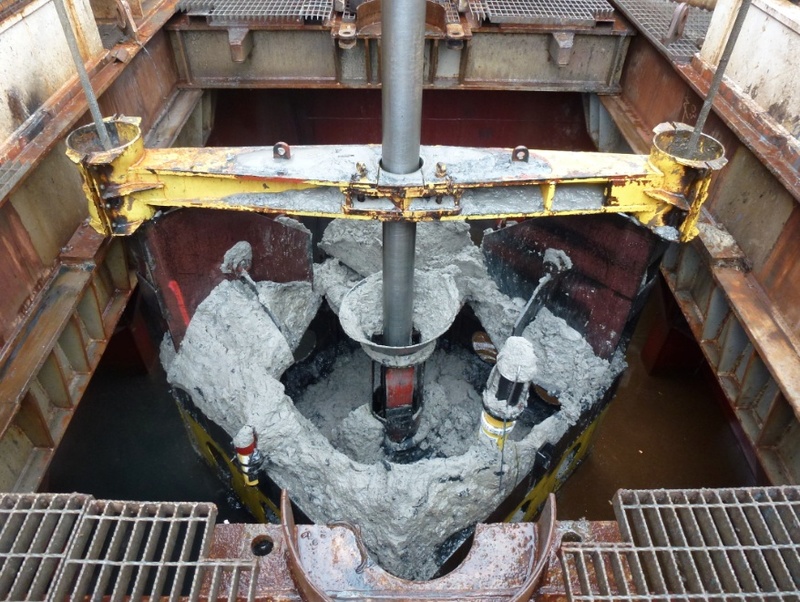 That is the big square hole in the middle of the ship where seawater sloshes around and that allows equipment and the drill pipe to be lowered down to the seafloor. 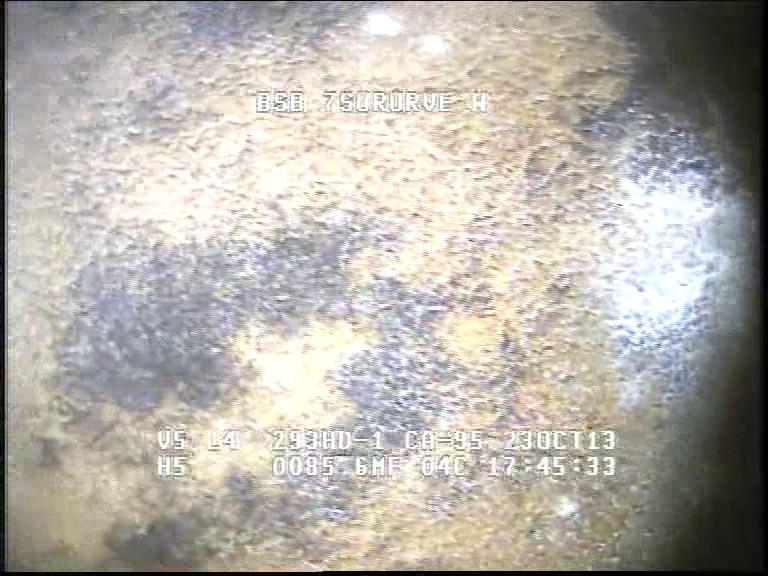 This is what the moonpool looks like from above when the “template” (the big frame that sits on the seabed during drilling) is brought up from the seafloor. 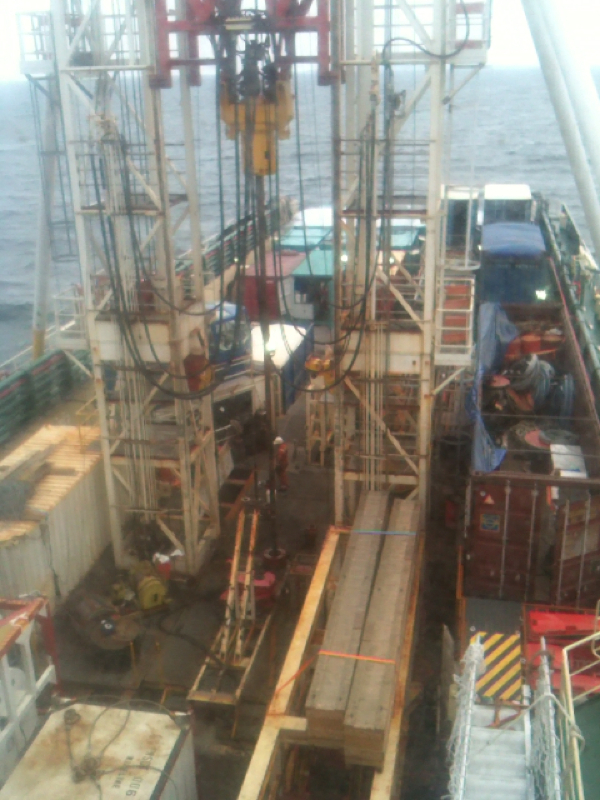 A hole in the deck is one of the wonders of a drillship! After being on the ship for one month, it was finally time for our mid-cruise port call yesterday! 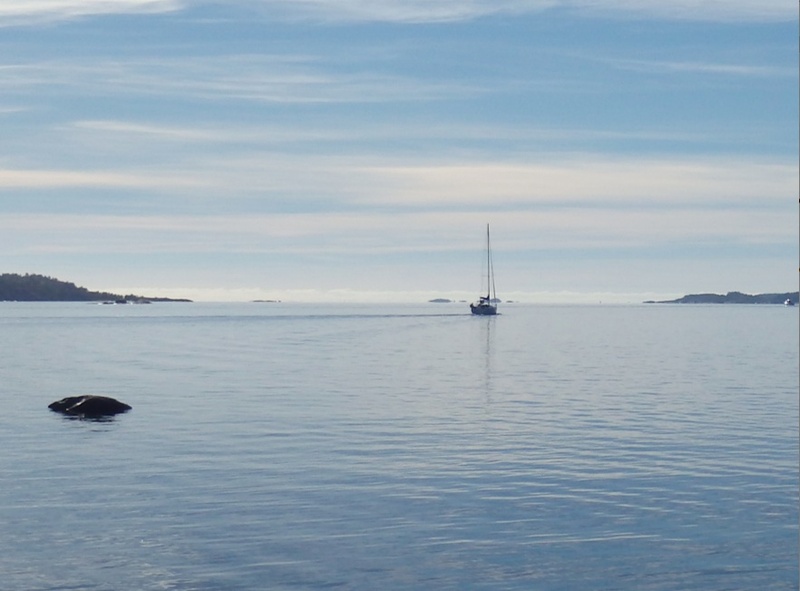 It was only 30 nautical miles to get to the harbor of Nynasham from Landsort Deep. We arrived there at 9h and were very eager to leave the ship. Luckily, it was only a short walk to town where we found many things, including food and all sorts of drinks. It was great to be on land again! …with magnificent views of the sea. 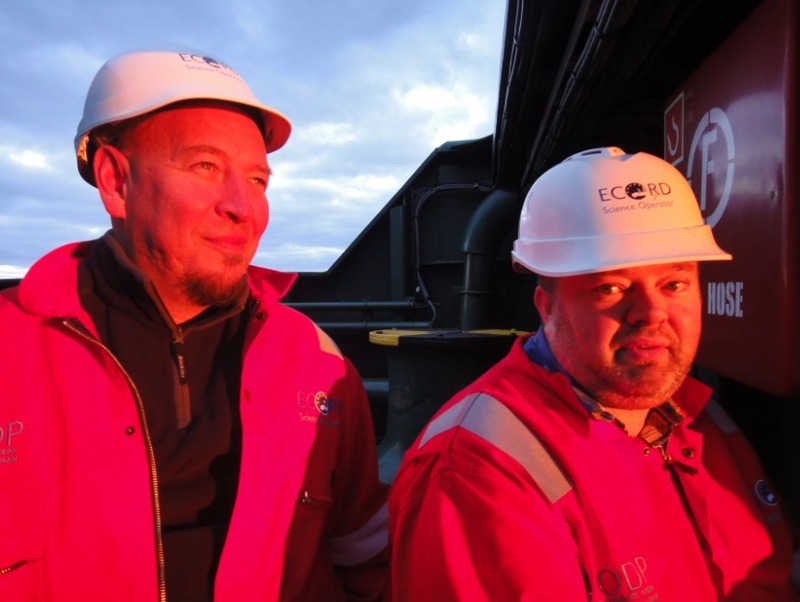 At 18h we all had to be on board ship again and we’re now already back at Landsort deep, drilling our third hole with even more enthusiasm! 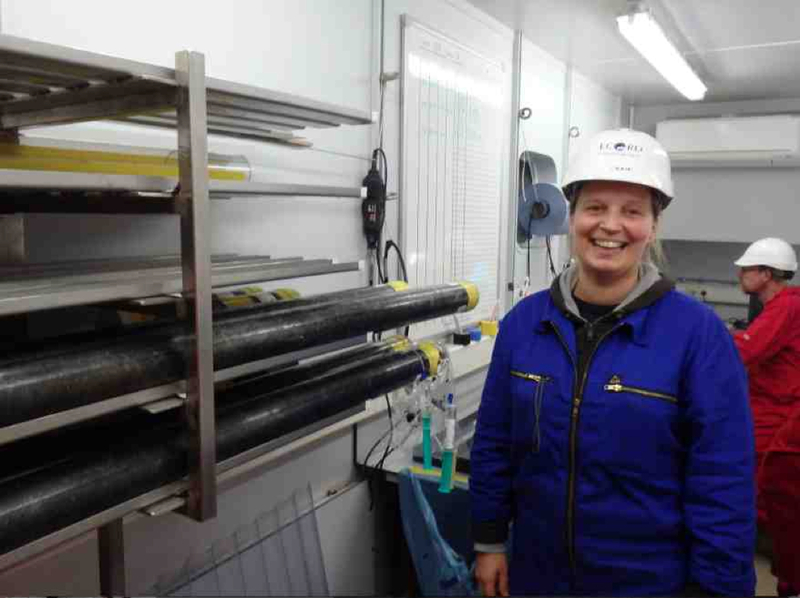 The contrast couldn’t be larger: after sampling varves in a forested river estuary, we are now drilling the deepest basin in the Baltic Sea: the Landsort Deep. With its water depth of 459 meters, there is a large distance to bridge with pipe before the drillers reach the sediment. This is an extremely interesting site for microbiologists and geochemists because of its unusual characteristics: the deeper water is completely devoid of oxygen and is instead rich in - highly toxic - hydrogen sulfide. The marine surface sediments here are black and extremely wet, soft and smelly. The sediment is full of methane gas. 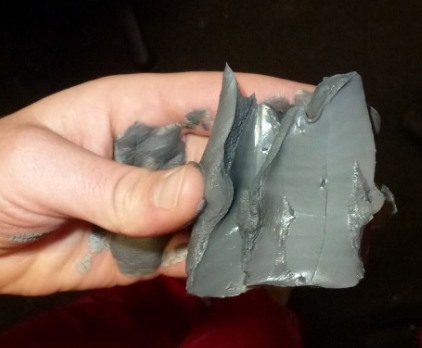 Drilling holes in the core liner comes with a risk…. The mud may squirt into your face! Below the black mud, we’ve found more greyish-green clayey sediments from the time when the Baltic Sea was a lake. 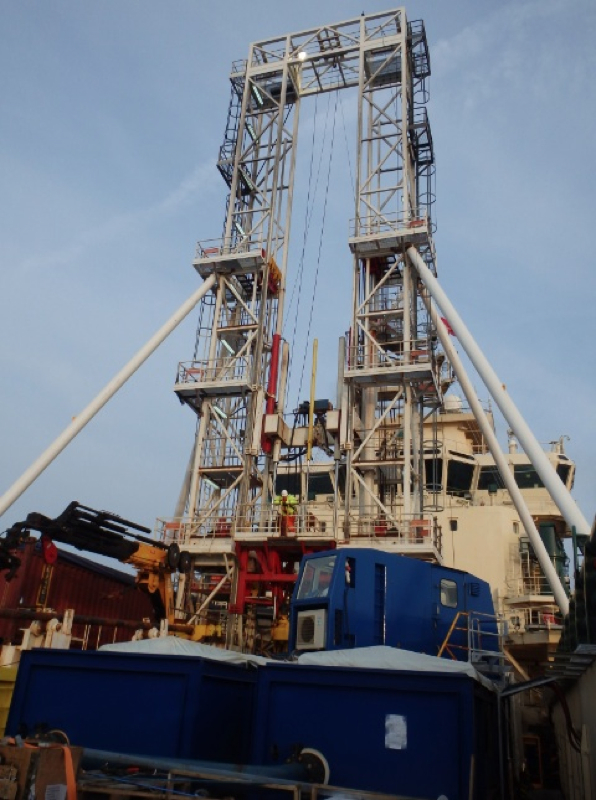 Drilling continues steadily, despite somewhat rougher weather conditions. 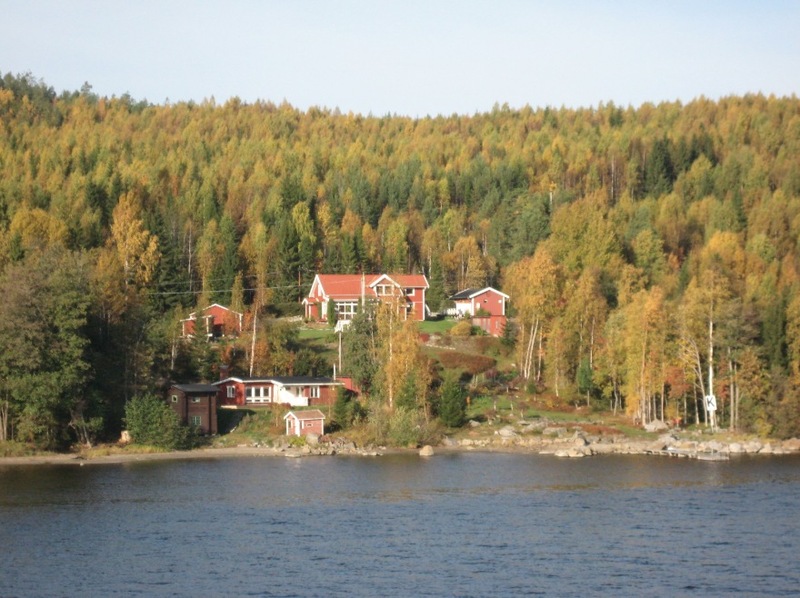 We’re sampling in the Ångermanälven River estuary (Bothnian Sea) and are surrounded by forested land. We came here with help from a pilot. Some parts of the estuary are very narrow and we’ll need his help to get out again. It’s quite a change - the lights that we see at night are nearby and are houses and cars not ships. It’s also colder here at night and there are strange smells from a factory nearby. The good news is that we have had a delivery of fresh vegetables, fruit and other food! We’re here to drill sediments with “varves”. These are annual deposits of clay that are visible as alternating dark and light layers in the sediment. We hope to get a record of varve formation and changes in deposition of sediment material for at least the past 10.000 years. Drilling is quick here! The holes so far have a maximum depth of only 37 meters. 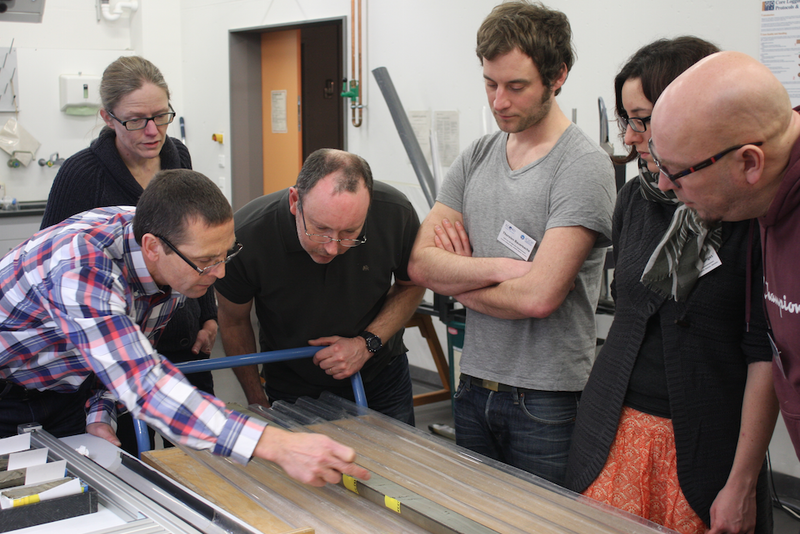 We’re also taking a few short cores (so-called Rumohr cores, less than 1 m long) to capture the sediment surface. We’ve already completed all coring at our third site and expect to complete the fourth site tonight. We will then leave the estuary and move to our fifth location in the Landsort deep, tomorrow. We hope to reach that in roughly 36 hours. 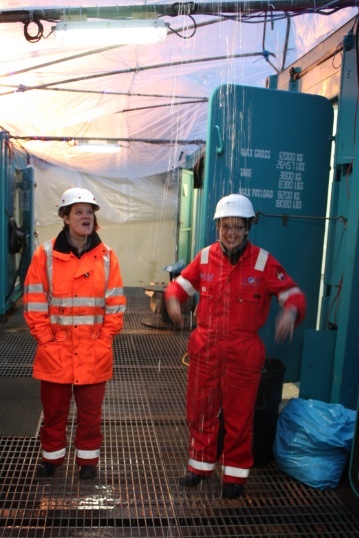 We’re looking forward to those sulfide-rich smelly muds from the deepest part of the Baltic Sea! We’re in transit! 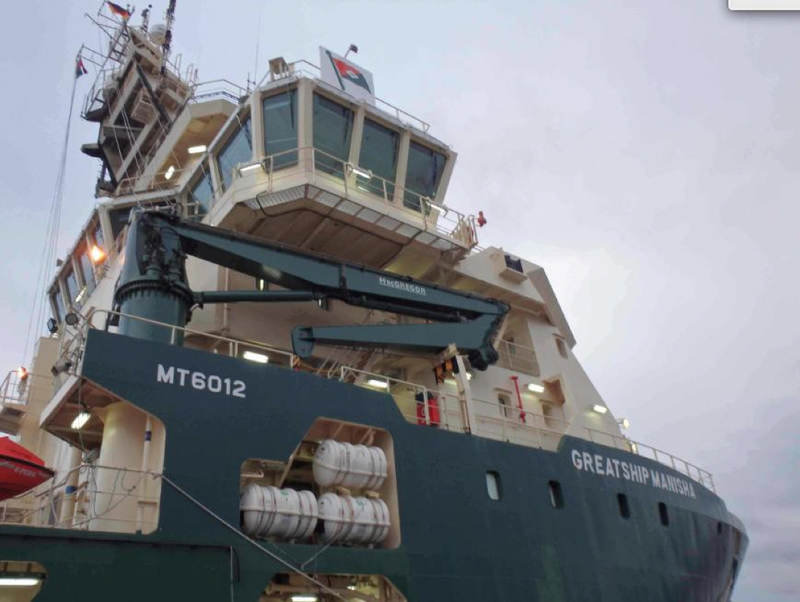 After successful completion of the second hole at Anholt in the Kattegat, we left for the Bothnian Sea on Tuesday at 10 a.m. It will take us 3 full days to get to our next two sites in the Angermanalven estuary, so we should arrive there on Friday. We passed “Hamlet’s castle” at Helsingor, at the entrance of the Oresund, on Tuesday afternoon. 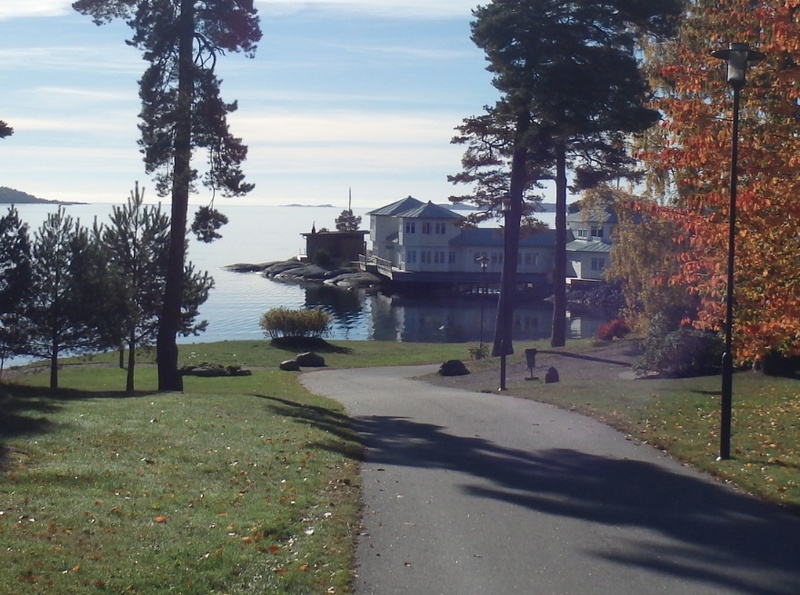 We are now somewhere along the eastern part of the Swedish coast. 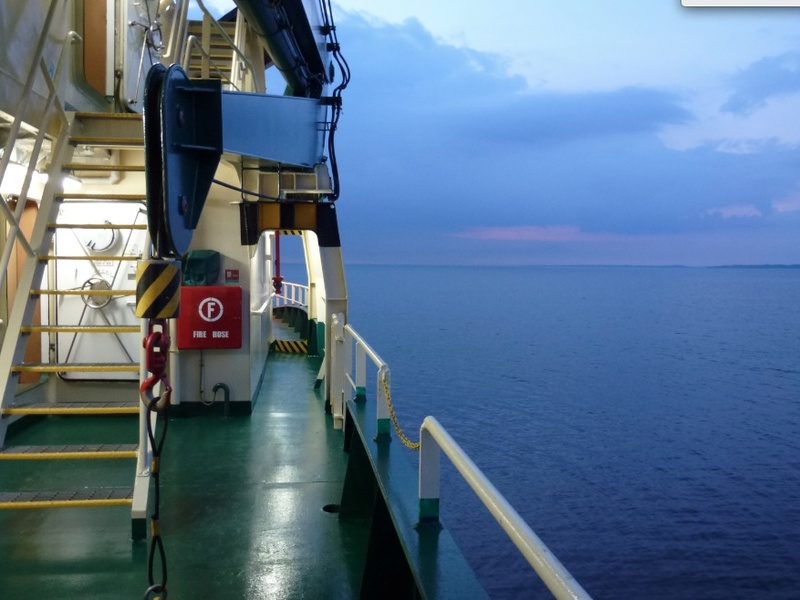 We hope the views from the ship will be equally beautiful in the north. 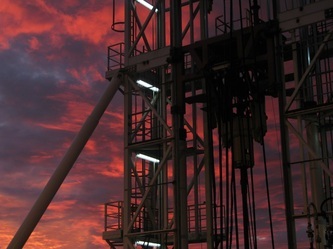 How old are the sediments that we are drilling? If you want to read the history of the Baltic Sea from the composition of a sediment core you need to know its age. We’ll date the cores with a wide range of instruments on shore and hope to have samples that capture the last 130 thousand years. But, we’re also trying to get a first idea of the age now. 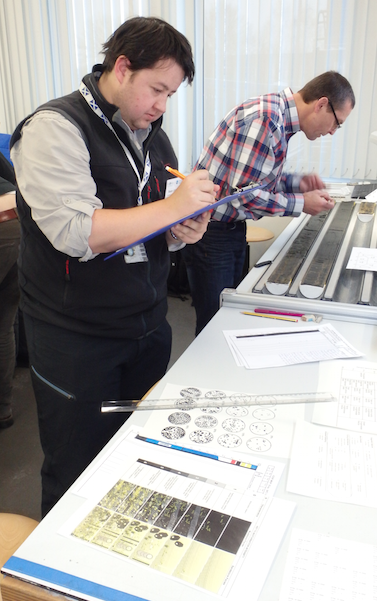 That’s why specialists in micropaleontology and sedimentology look at small samples from every 3 m of core directly. They touch, taste, sieve and wash the samples and study them microscopically in their search for tell tale signs of environmental change. Low salinity pore waters can be indicative of former lake sediments. This is why pore water salinity is one of the first things the geochemists on board measure. 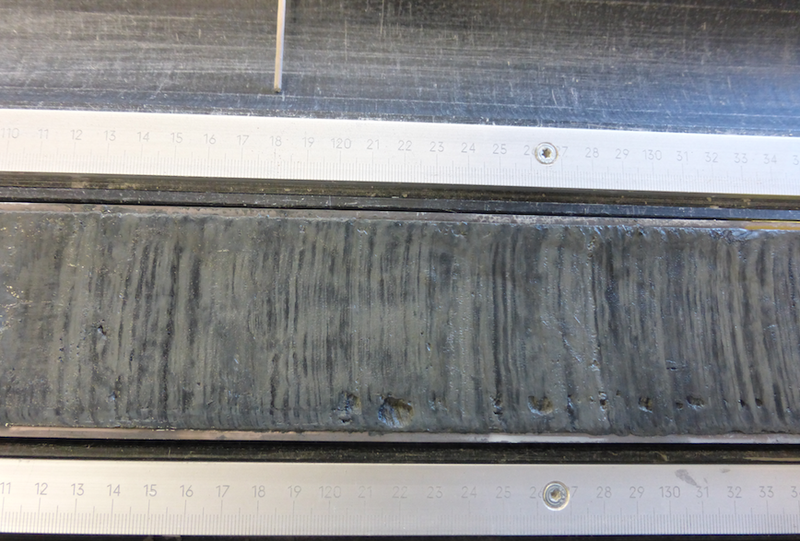 We also get a lot of information on sediment composition from the geophysical measurements done on whole core sections. On every shift, there are people responsible for these tasks. Meet some of the night shift team, from right to left: Andrea, Michael, Thorsten, Nadine, Patrizia, Bo, Outi (with Barry’s helmet just visible behind her), Annette, Mary and Caroline (that&apos;s me). 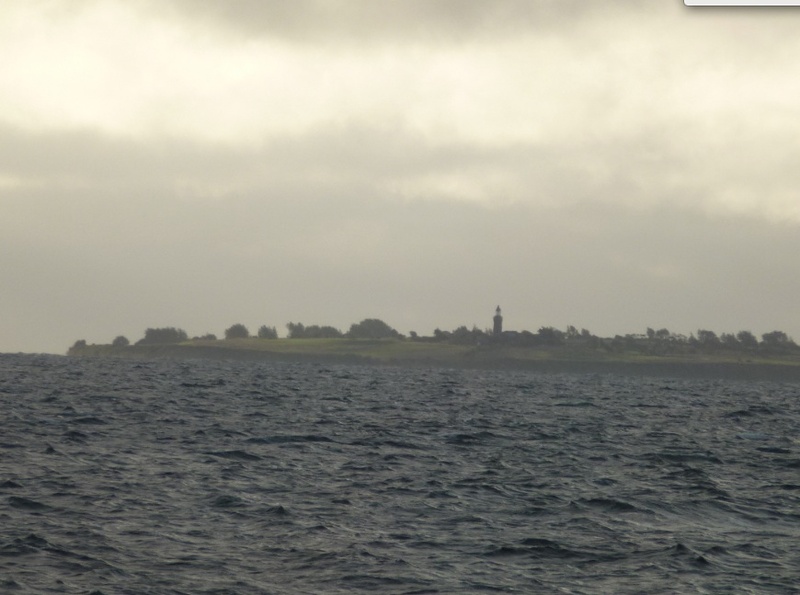 Our second site is close to the island of Anholt in the Kattegat providing us with new views from the ship. This implies that we see less land and more waves. Sunrise is still equally beautiful. 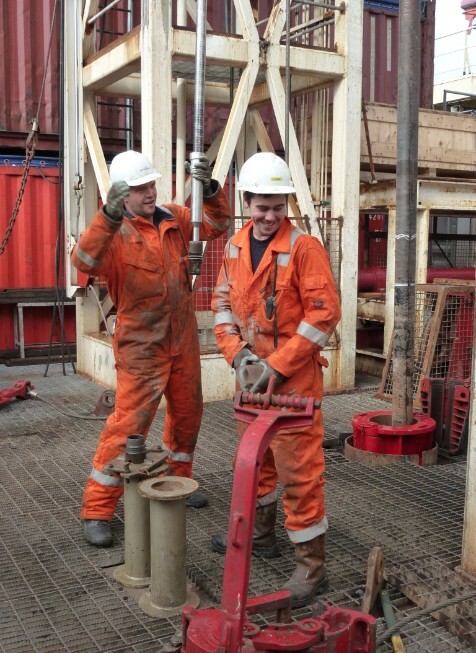 We’re now drilling beyond 80 meters depth and the cores are steadily coming in. 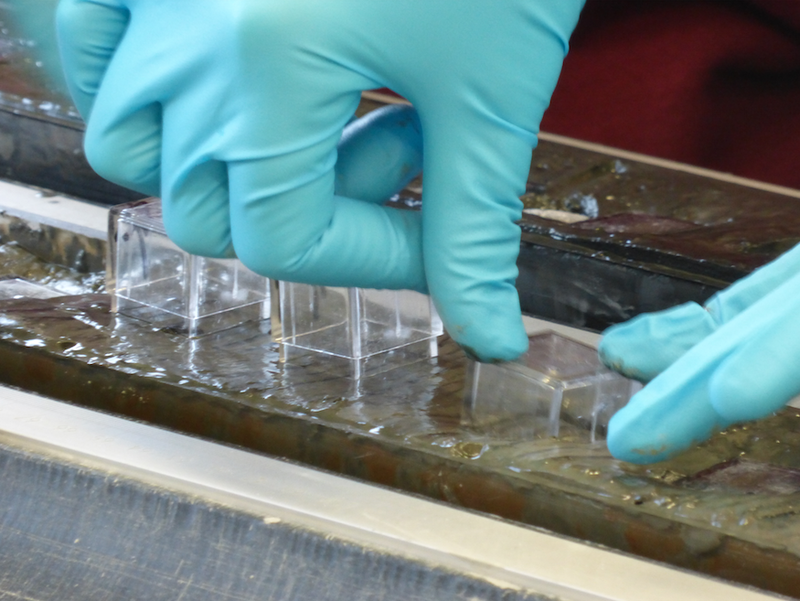 The samples include clays from which it is sometimes difficult to extract sufficient pore water for analysis. We cherish every drop we can get and in such cases usually still can measure some basic parameters such as salinity and pH. 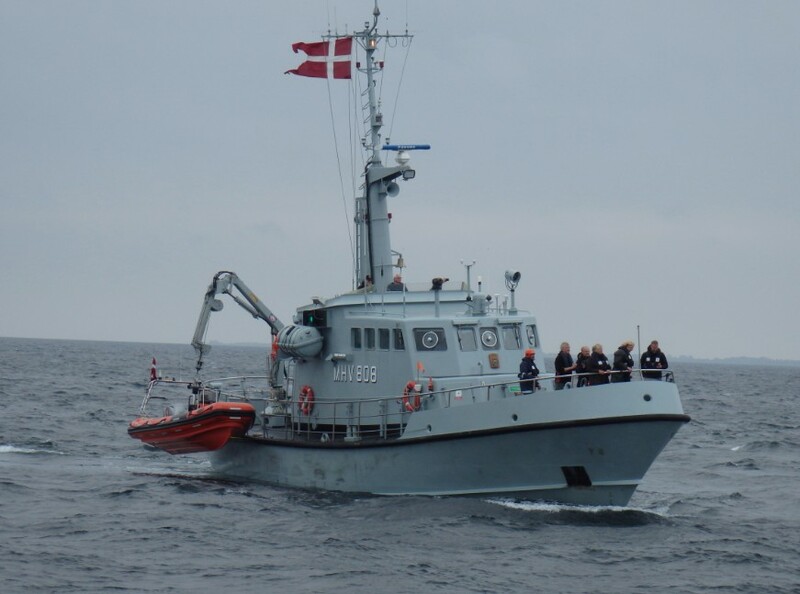 Our sampling in Danish coastal waters has attracted quite some media attention and we’ve had various Danish journalists visiting or passing the ship over the past few days. 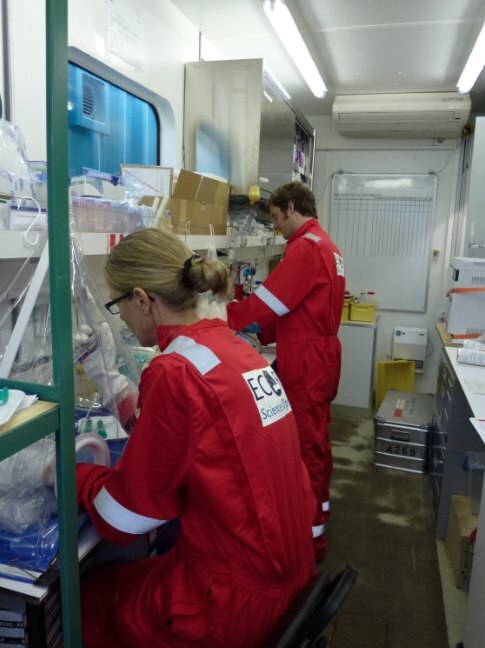 We’ve also had a small boat bring extra drinking water and other supplies and some of the microbiological samples have been taken to a laboratory on land. The boats range in size from speedboats to quite impressive small ships. Mostly, the journalists are interested in talking to our co-chief scientist Bo about the microbiological research during the expedition. All work in the Little Belt has been completed. 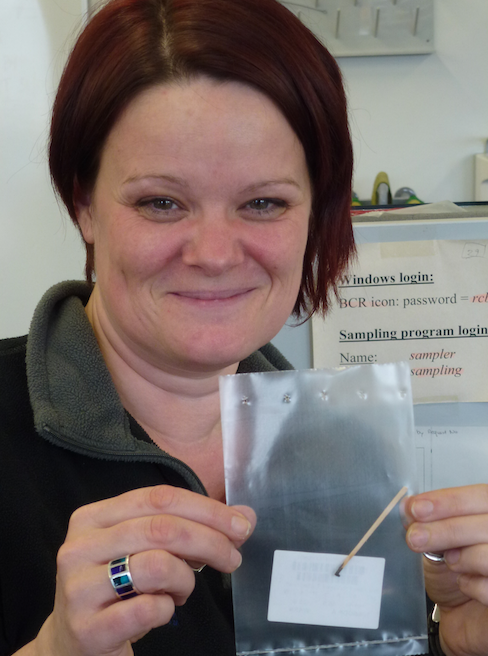 This first station was a success and we all treasure our samples, how ever small. 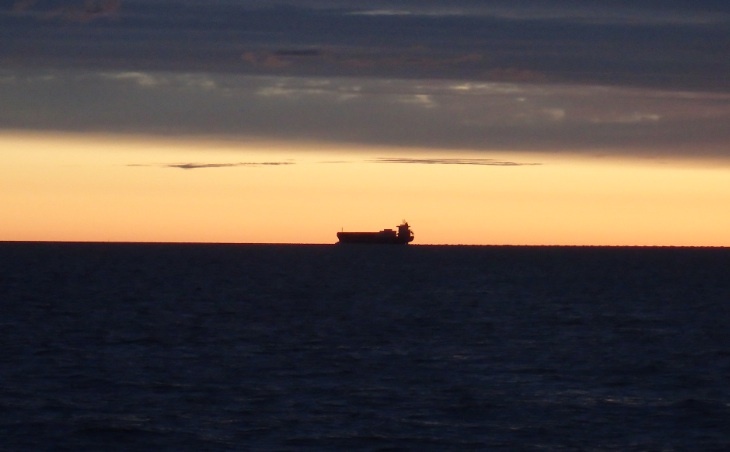 We are now in transit to our next site in the Kattegat. We hope to start sampling at our second site, BSB1, early this morning. While we started with sampling mud only, we are also meeting glacial deposits that consist of gravel, sand and stiff clays that are more difficult to core. These sometimes require types of equipment, that do not allow samples to be obtained. 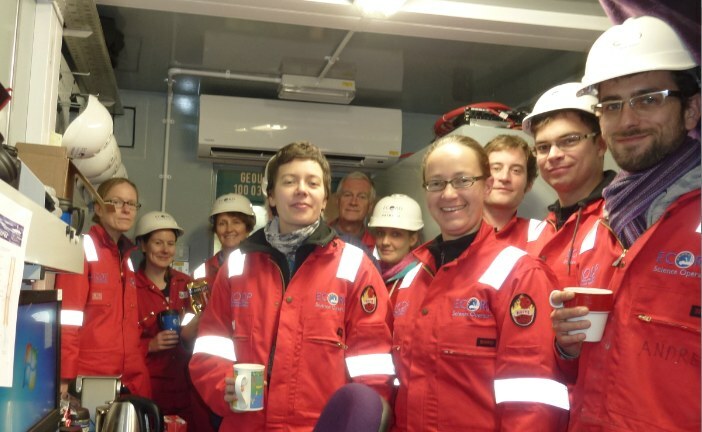 Carol, the ECORD expedition manager, and our chief scientists give us regular updates on progress, so that we are always ready when our samples arrive. We’re not very far from land and can see the shore nearby. The weather so far has been great. Although we have an occasional rain shower, with sudden wind and waves, the sea is calm most of the time. 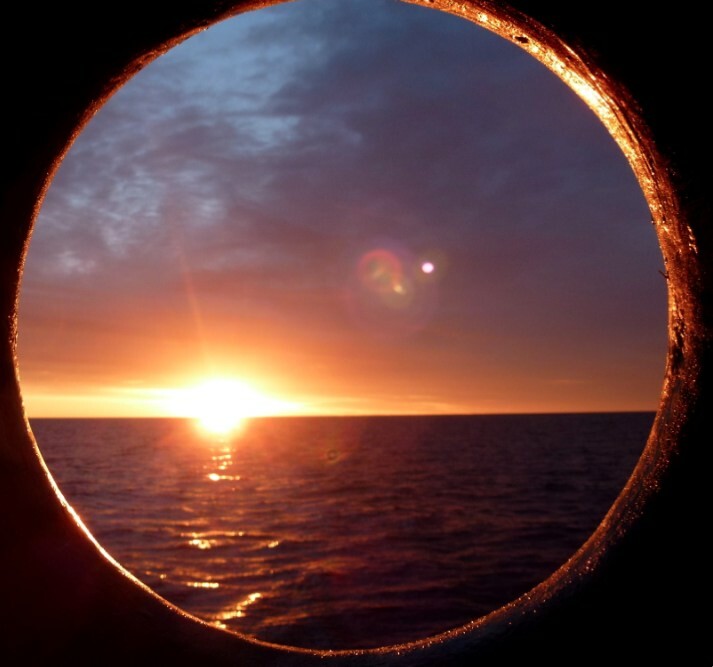 The advantage of being on the nightshift is that you can see the sun rise, and can even enjoy the early afternoon on deck when it is sunny. And if you can’t sleep, you can see the sun go down again as well. 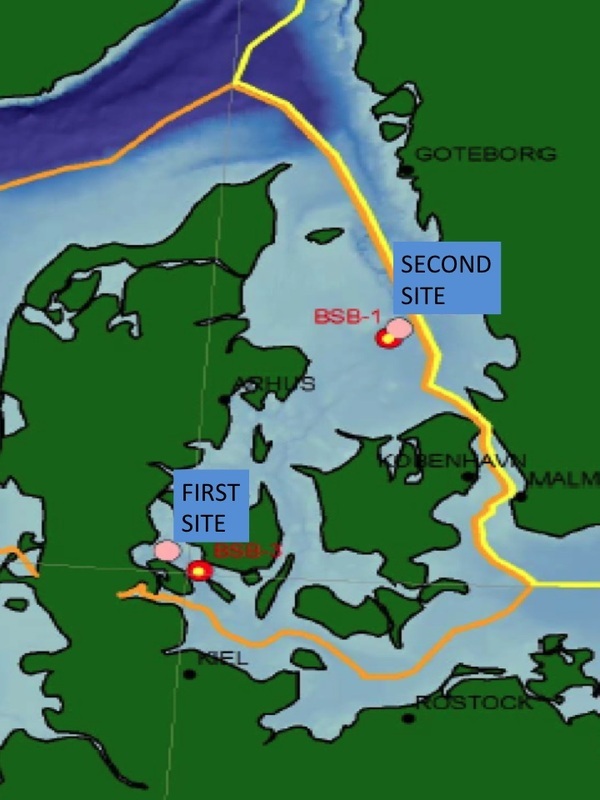 Our first station is located in the "Little Belt" near the Danish coast. On Friday evening, the first core came on deck. 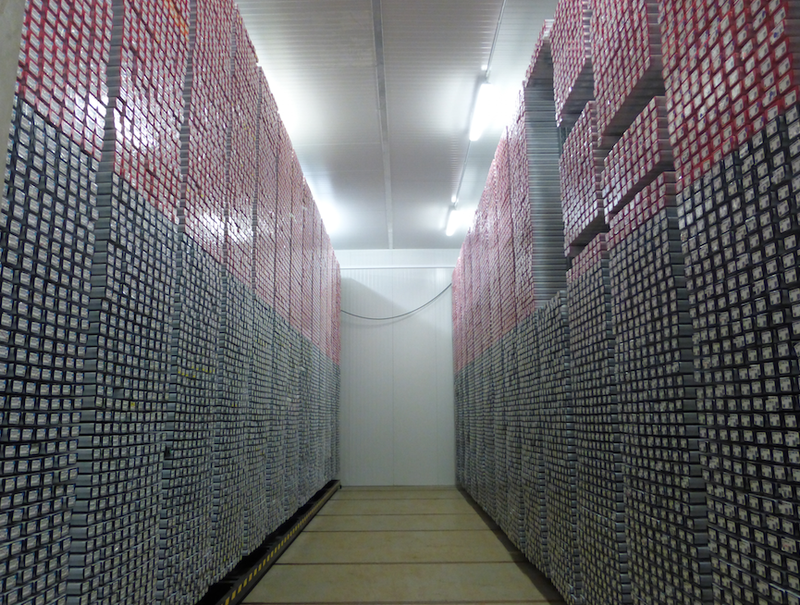 Since then we have been very busy processing more than 70 meters of sediment core. Working on the smelly (hydrogen sulfide), gassy (methane bubbles), greenish-brown mud is a pleasure! 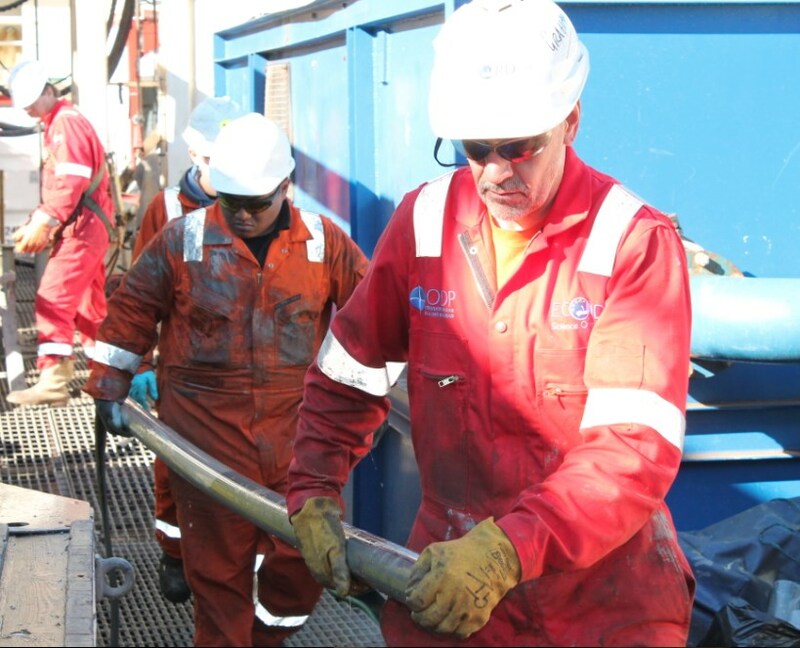 Although the sediment cores that we took so far are not sampled in detail (there is no time for that now), we do drill small holes in the core liner to extract the porewater. Also, a small part of the sediment from each core end is studied visually by sedimentologists and micropaleontologists. Combined with results of geophysical measurements, we already have an idea of the environment of deposition of the sediment. With the rest of the "nightshift" team, I&apos;m gradually getting used to working from midnight to noon. There is not much time to do more than work, eat and sleep. Because we&apos;re all on different schedules, hot meals are served every 6 hours. So you can eat hot curry or pizza for breakfast! We are finally on board the ship! Greatship Manisha arrived in Kiel Wednesday night and we were allowed on board early the next morning. 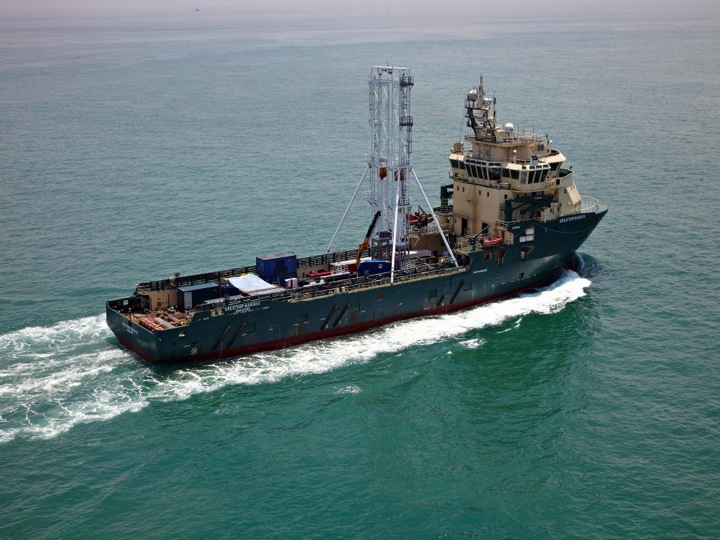 The ship is a 3-year old drill-ship from a commercial contractor that has been modified for this expedition. On board we got a quick tour, including safety instructions. More pictures will follow when the internet here allows it! 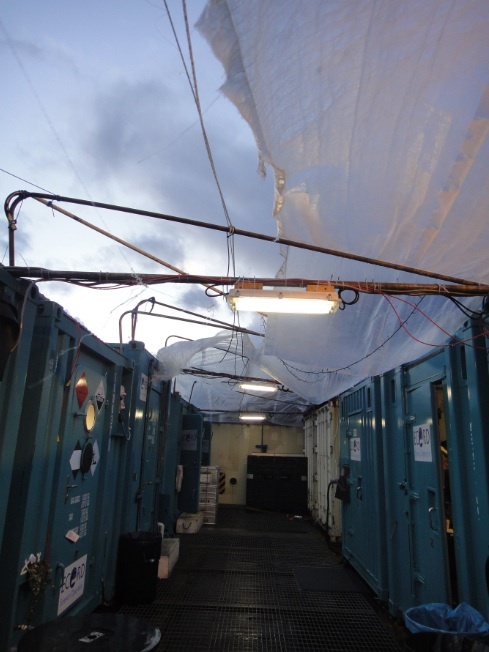 The scienceteam works in labs in containers on the back deck of the ship.This part of the ship is the "Science garden" - with some real plants! 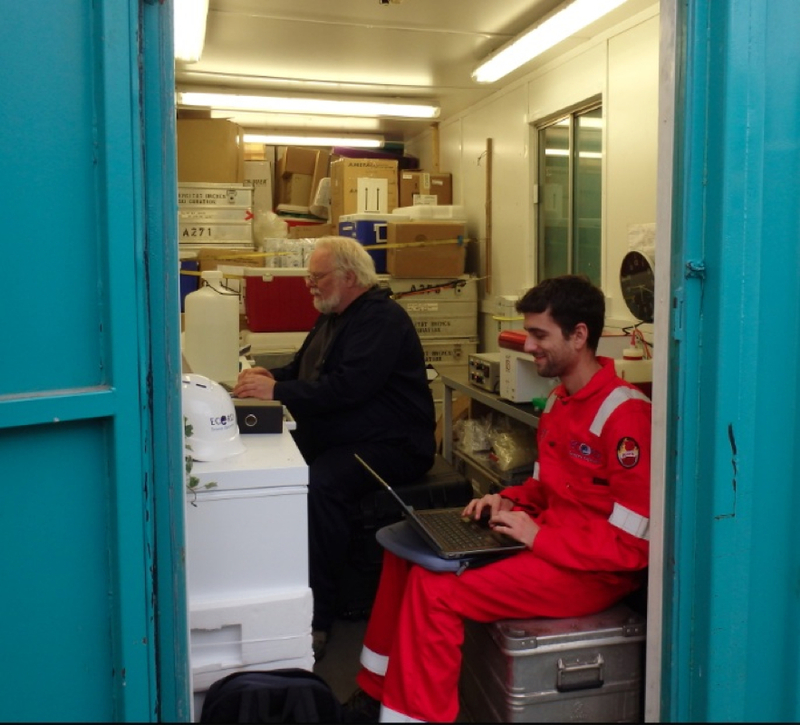 I will mostly be working in the Geochemistry container with Thorsten, Jeanine, Dalton, Luzie and Patrizia. We&apos;ll be analyzing salinity, sulfide, ammonium, alkalinity and methane in porewater. 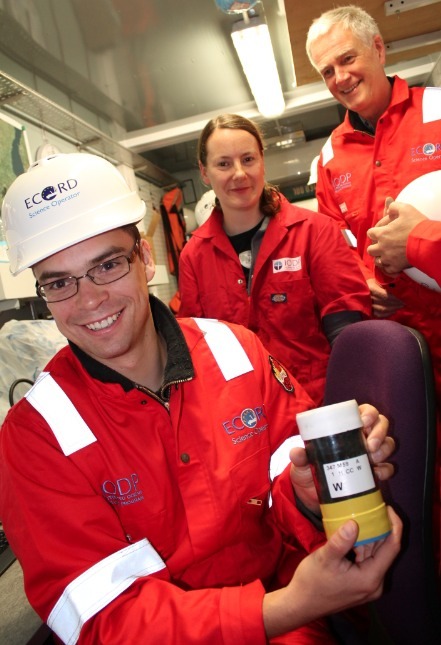 We will get the porewater samples from the "curation container" where the water is either squeezed or sucked out of the sediment cores. 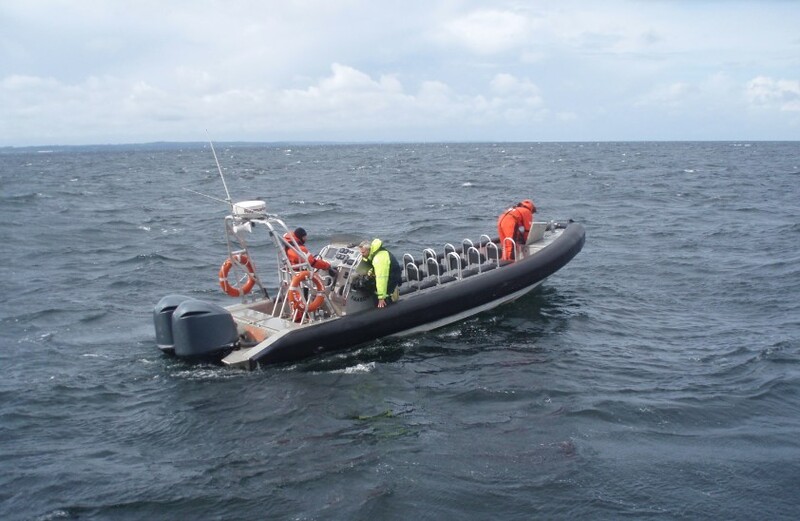 We&apos;re also responsible for subsampling the porewaters and storage for later analysis on land. Our living quarters are located at the front of the ship. There are 66 people on board & we have 4 meals a day. The drill-deck is in the middle of the ship, but that area is off-bounds for most of the science team for safety reasons. We&apos;ve all got brand new red overalls and hardhats to wear when working. We&apos;re at the location of our first site now and hope to get our first sediment samples soon. Hi, I’m Caroline Slomp. 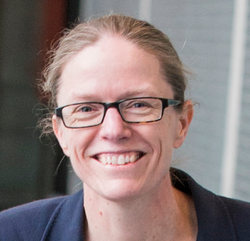 I’m a geochemist from Utrecht University, the Netherlands. 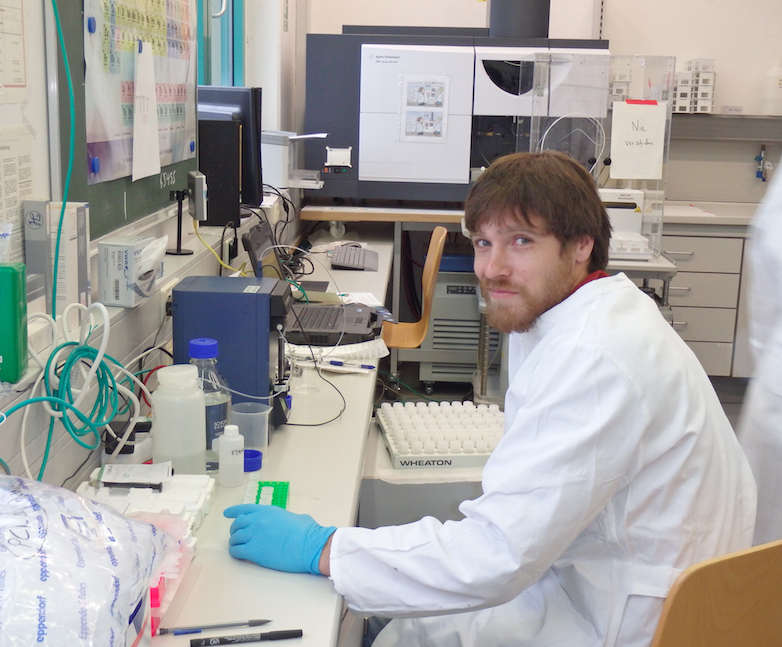 I study the chemistry of the seafloor in areas where the seawater is low in oxygen, such as the present-day Baltic Sea. I have a specific interest in understanding the history of low oxygen in seawater and identifying the causes. Low oxygen is a problem for fish and other higher organisms living near the seafloor. If we know what factors cause low oxygen in seawater, it is easier to design measures to improve the situation. 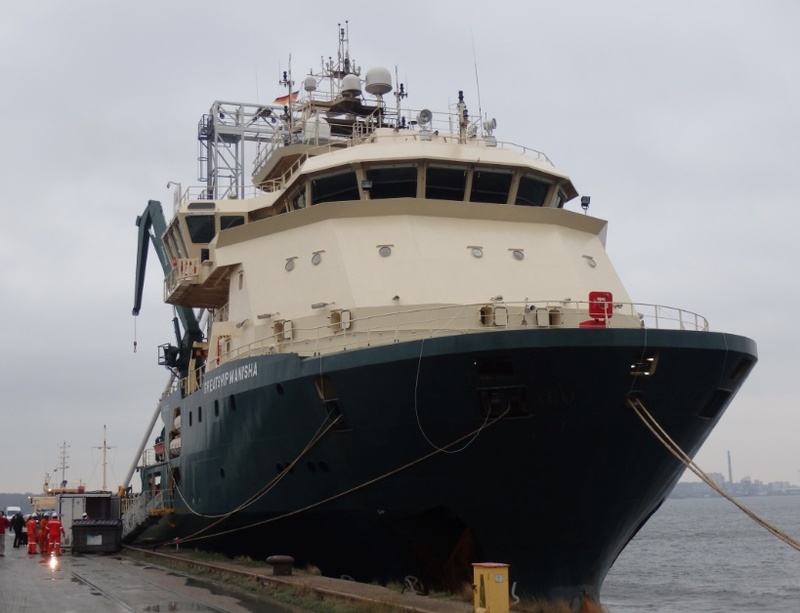 I will soon be joining a cruise of the Integrated Ocean Drilling Programme (IODP). 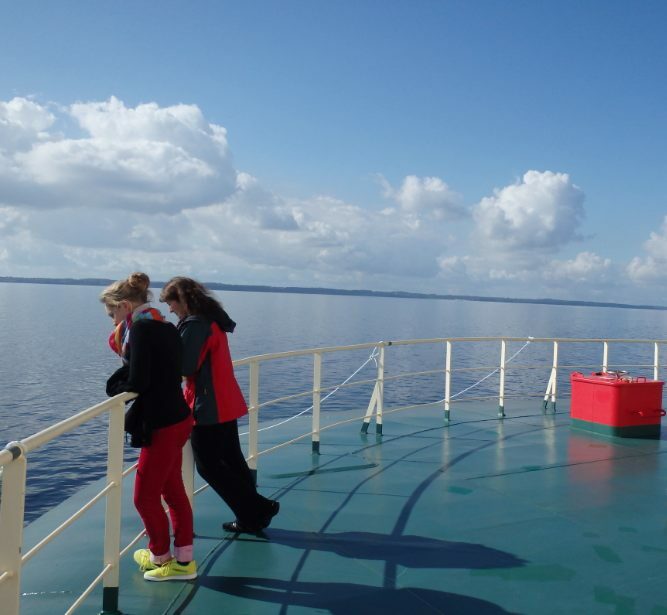 We’re going to study the history of the Baltic Sea. We’re sailing with the Greatship Manisha from Kiel and will be at sea for 60 days. 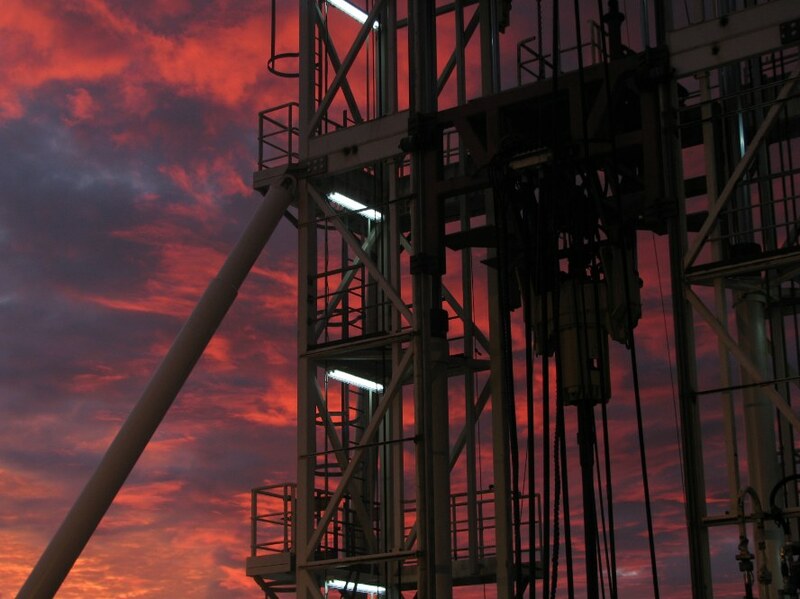 One of our major targets is to obtain sediments from a previous warm period (“Eemian”) ca. 130.000 years ago, when the Baltic Sea was likely also low in oxygen. This will be the first time these sediments will be cored! On board, we’ll be working in 12-hour shifts so that the collection and processing of sediment samples can continue 24 hours a day. 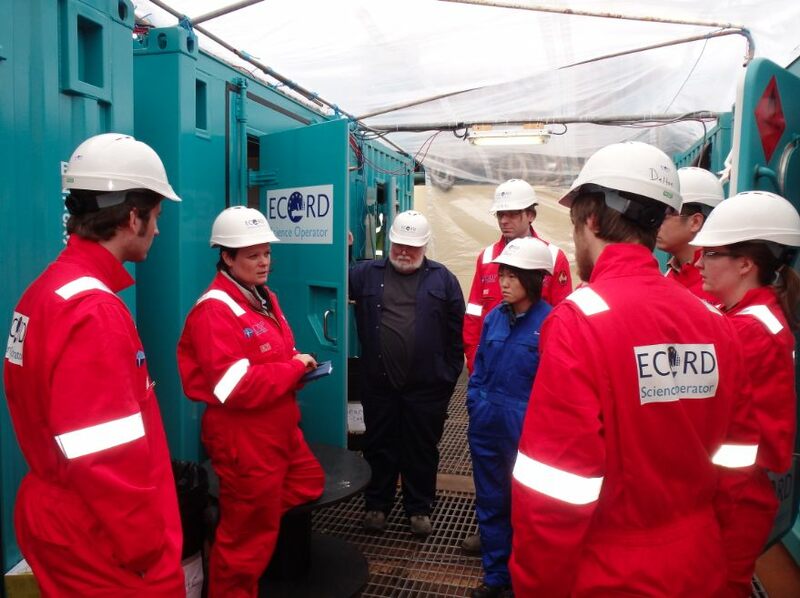 The European Consortium for Ocean Research Drilling (ECORD) is responsible for all practical procedures. 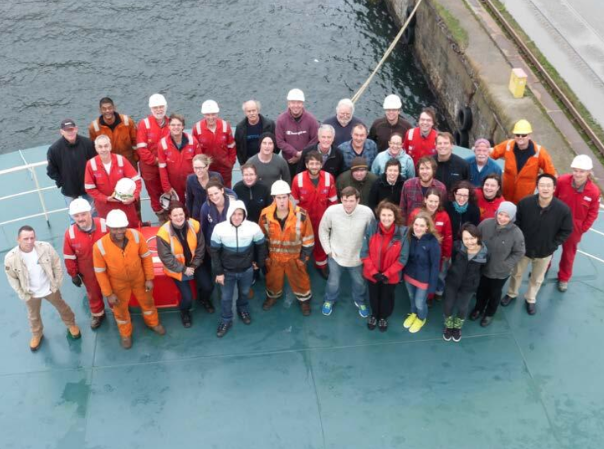 We have a small but very motivated team of 17 scientists on board ship, led by two co-chiefs, Bo Barker Jorgensen and Thomas Andren, to process the samples and interpret preliminary results. We are ready to go!